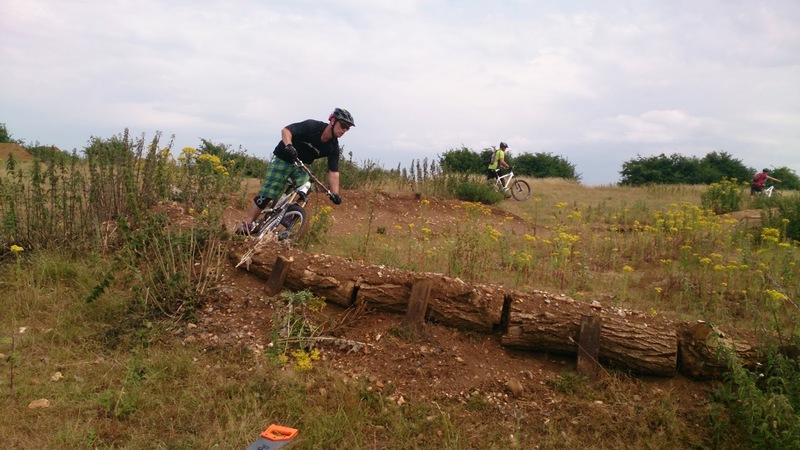 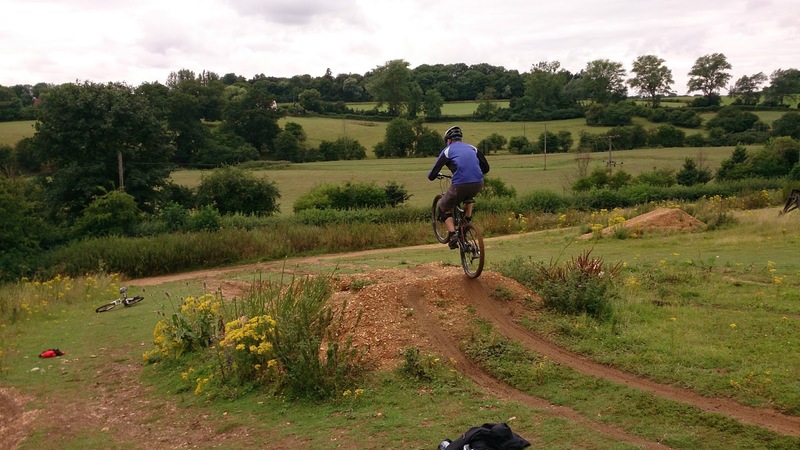 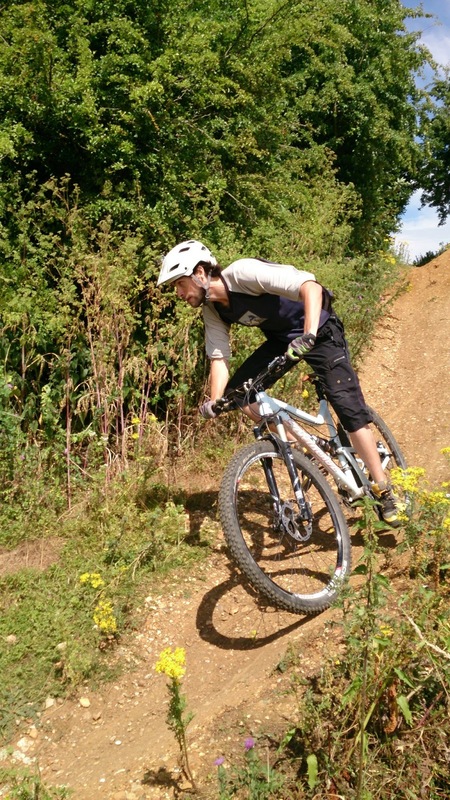 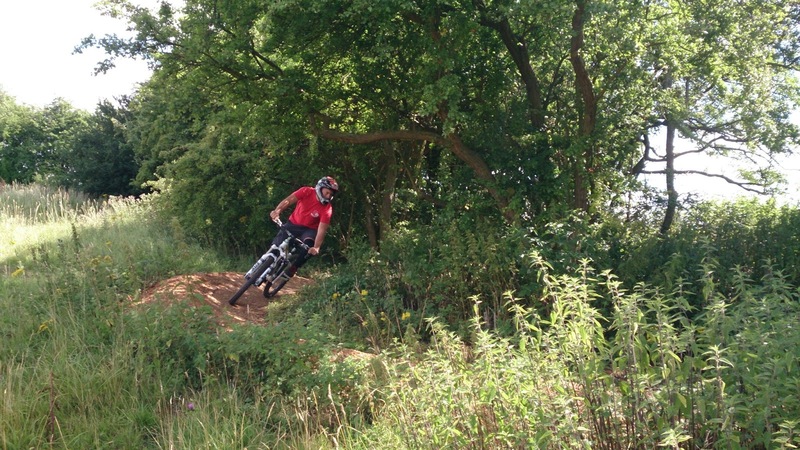 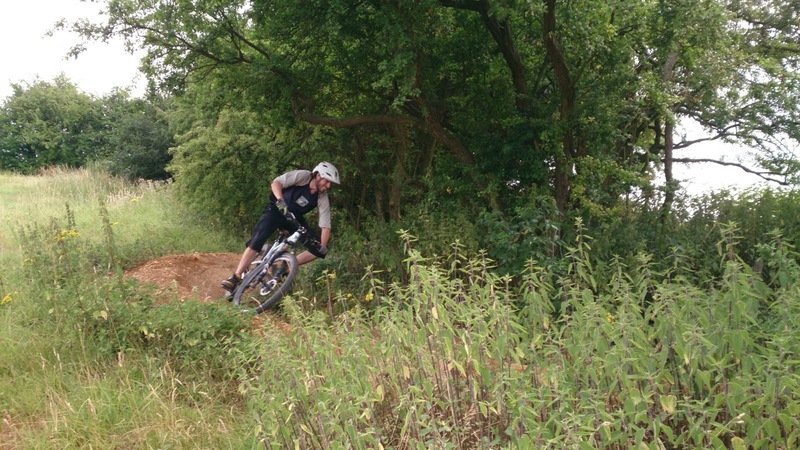 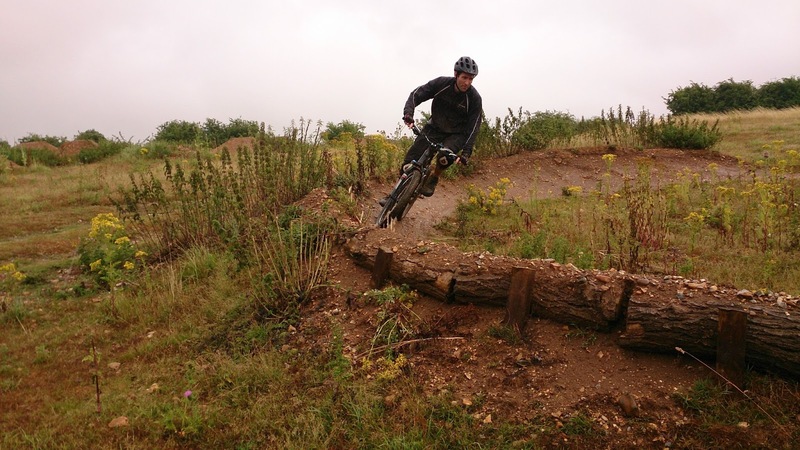 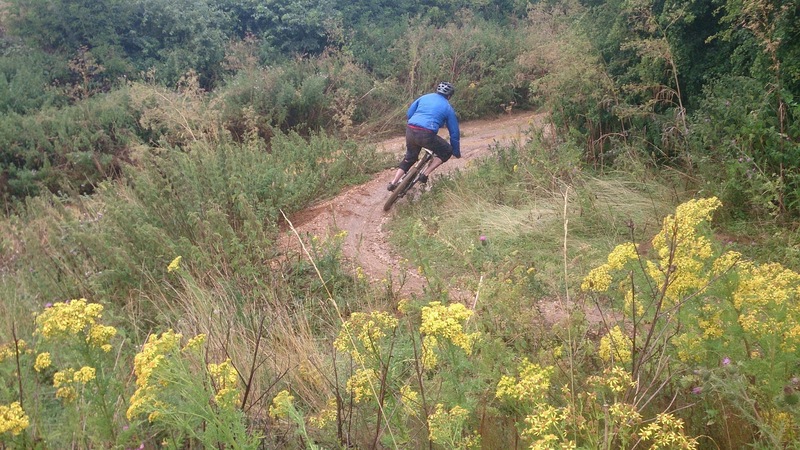 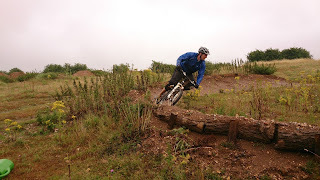 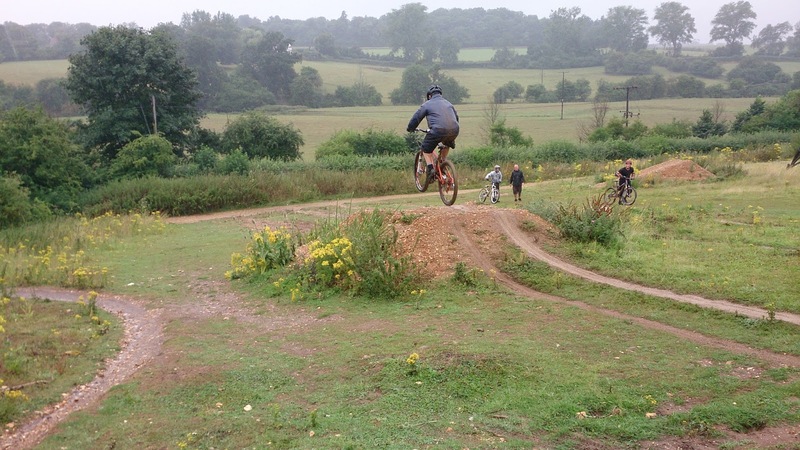 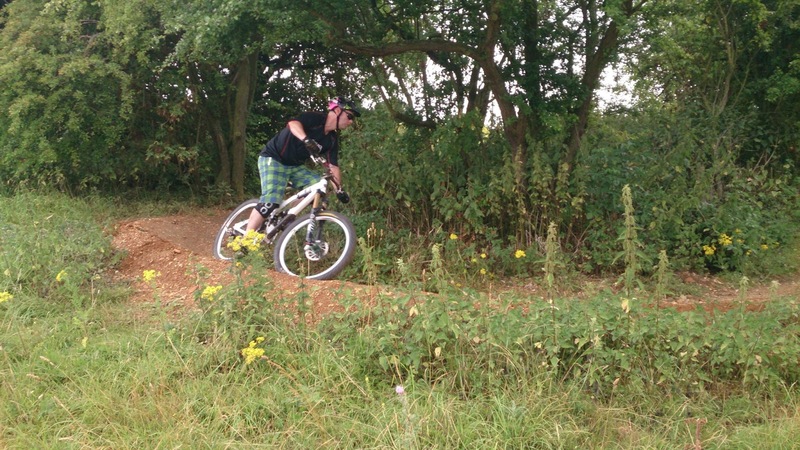 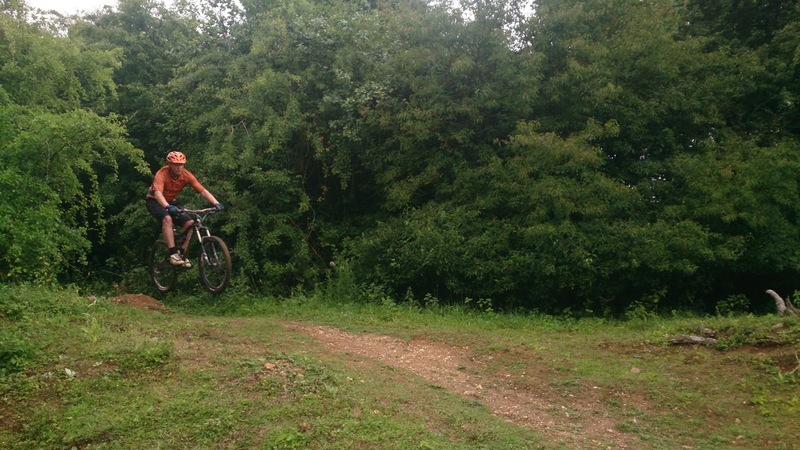 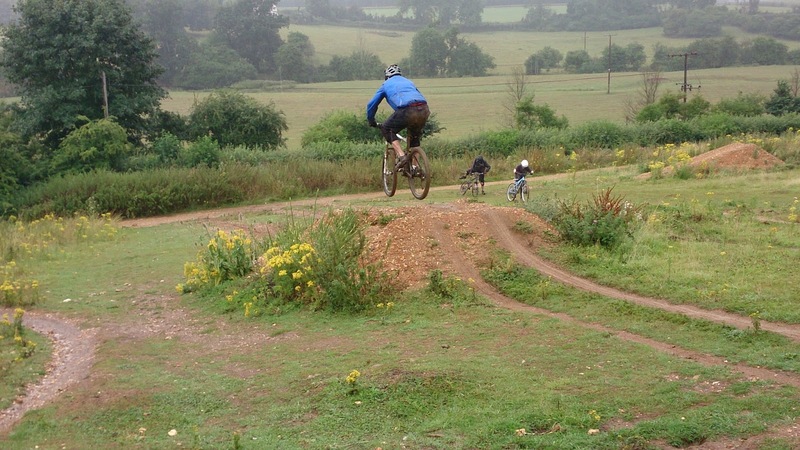 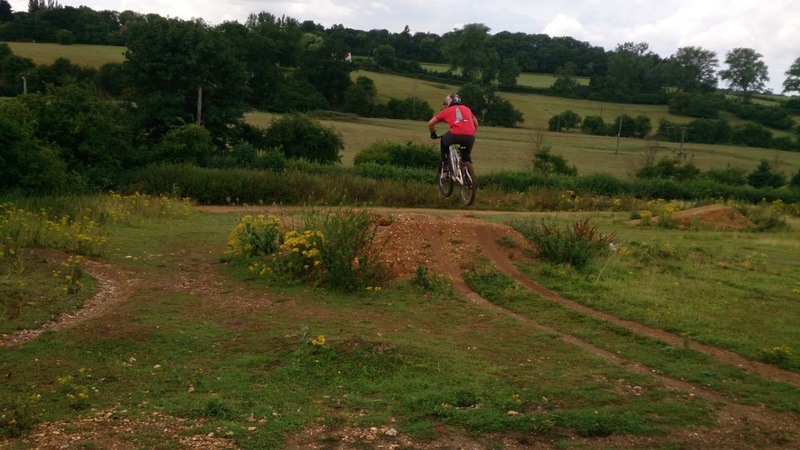 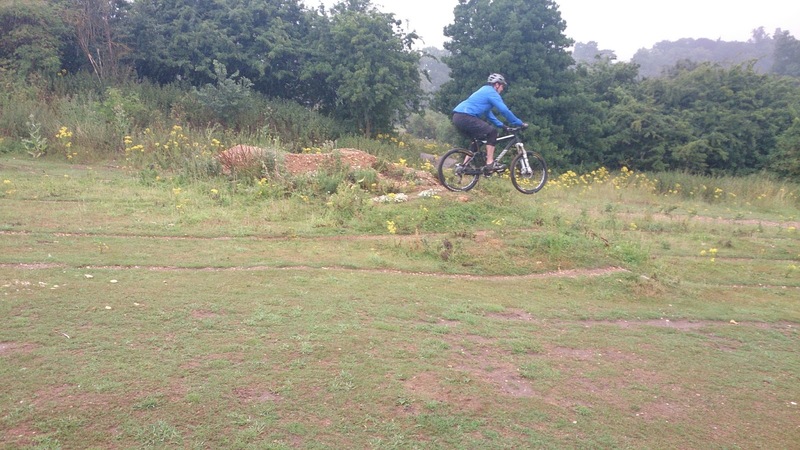 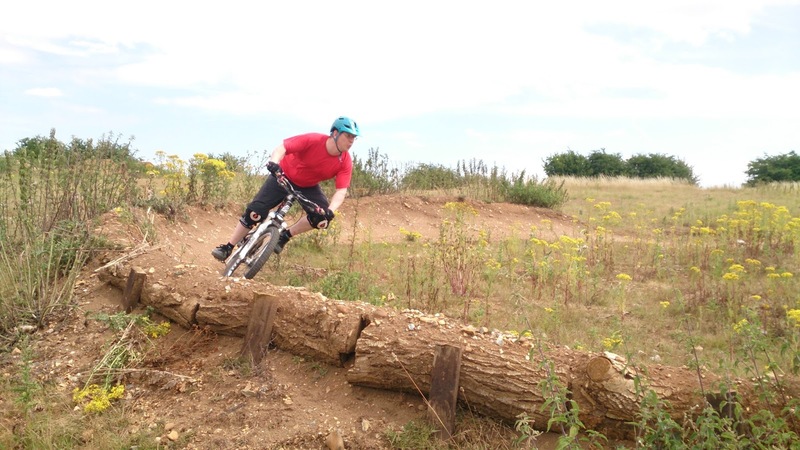 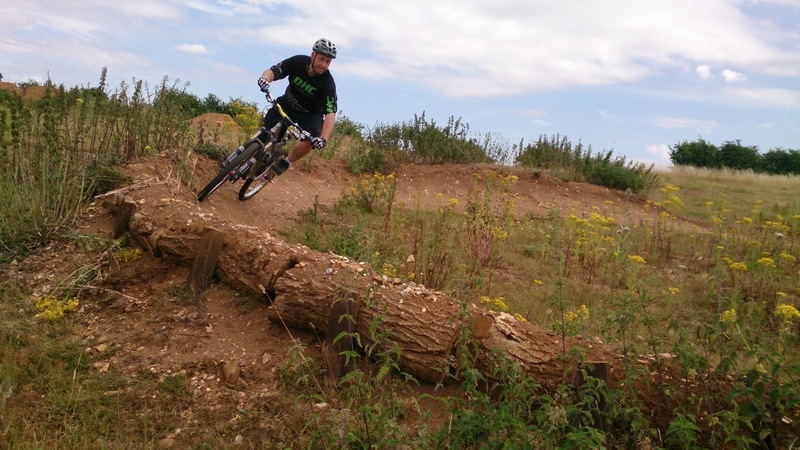 Chris was coached by myself last year and returned to bring his riding on some more. 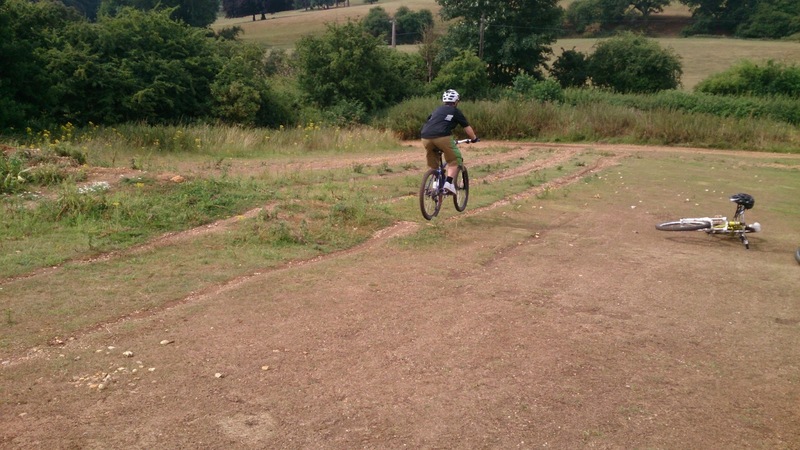 The skills check showed me I needed to work on a footwork error and his mental skills. 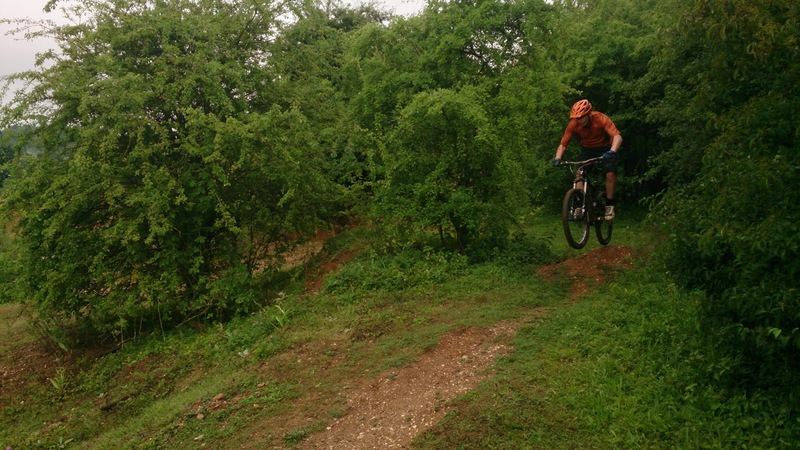 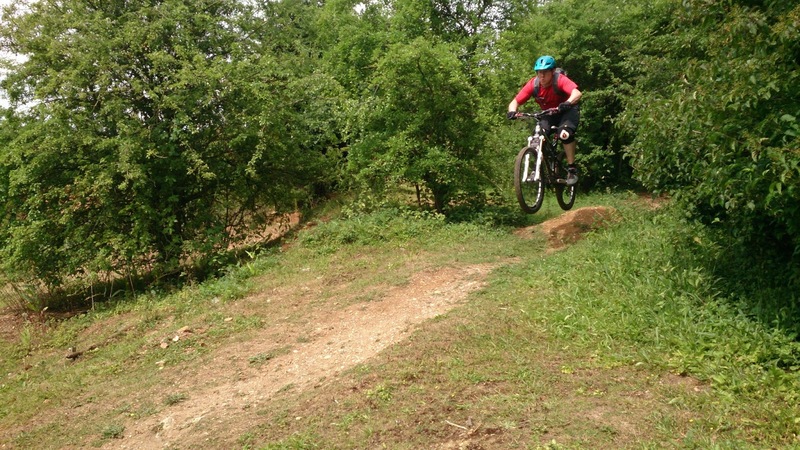 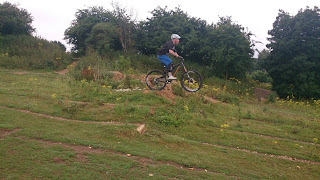 The drops and the 6ft tabletop and gap jump sailed past before the morning was up and we moved on to riding another trail that has steeper sections, pumping, corners, jumps and near vertical drops. 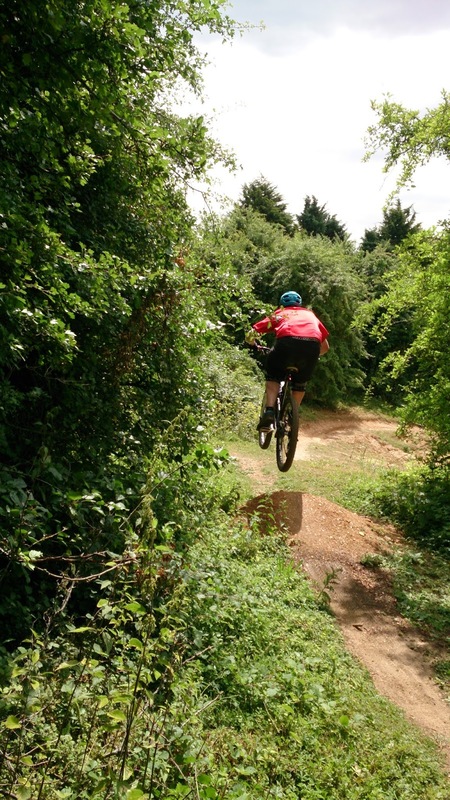 I worked on his control of the trail and soon he was flying. 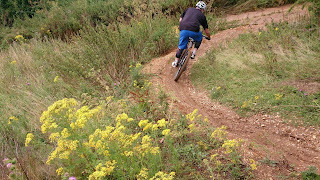 We spent a while on the trail before taking a coffee break and on resuming,we moved to riding alpine style switchbacks and again his skills sets shone through as he nailed them easily. 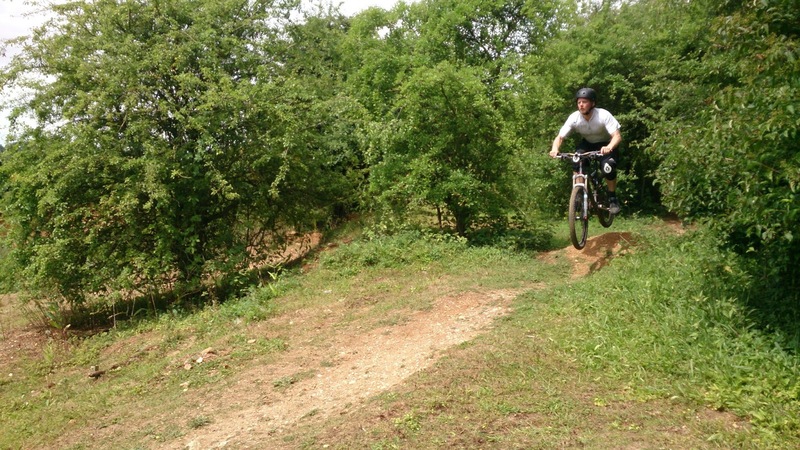 I really wanted to develop his pumping of the trail more and more advanced techniques for doing so and he really connected to the trail, choosing when to jump or absorb and he carried speed through 2 berms later too with a big smile as his footwork fault was now corrected. 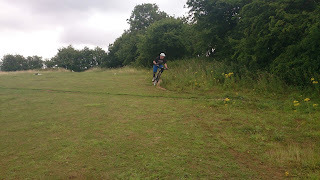 We linked the whole pump and jump together top to bottom and I could see the mental side of the coaching session was draining him and we took another break but soon after he declared himself knackered and happy so our session ended. 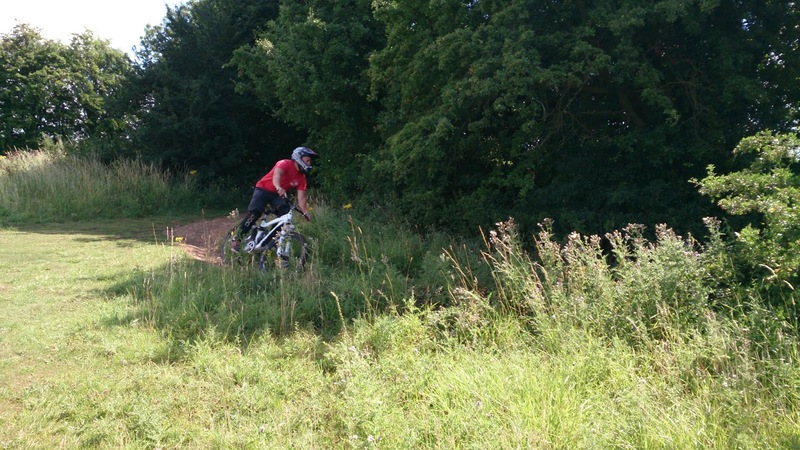 Phil and Simon arrived as planned, so I began as always with the skills checks, where I discovered I needed to work on mainly looking and body positioning, but also on a little bit of footwork. They also showed me that they unweighted the bike naturally, and that I just needed to add looking to their skills set. After a few set up changes, we moved straight onto some drops, and here I explained the mental skills set, and soon they were both riding the larger drop, and commenting on how comfortable it felt. 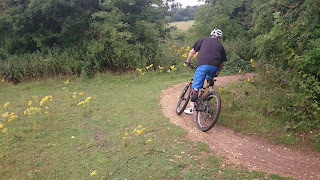 I then gave them a cornering exercise so they could work on their body positioning, before moving onto the trail. 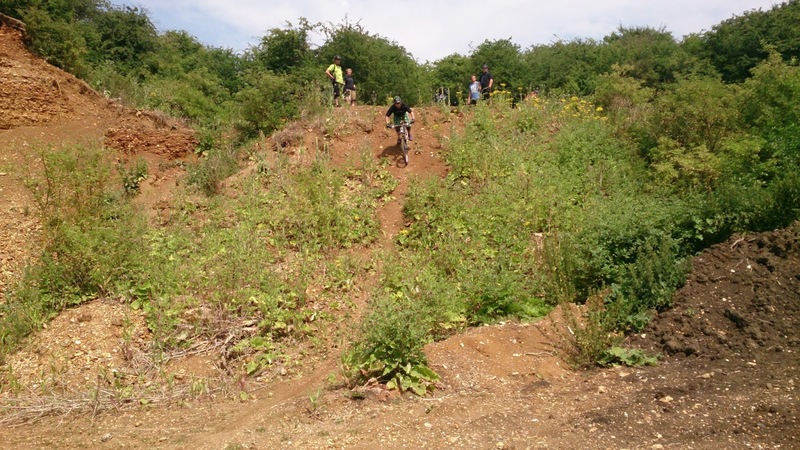 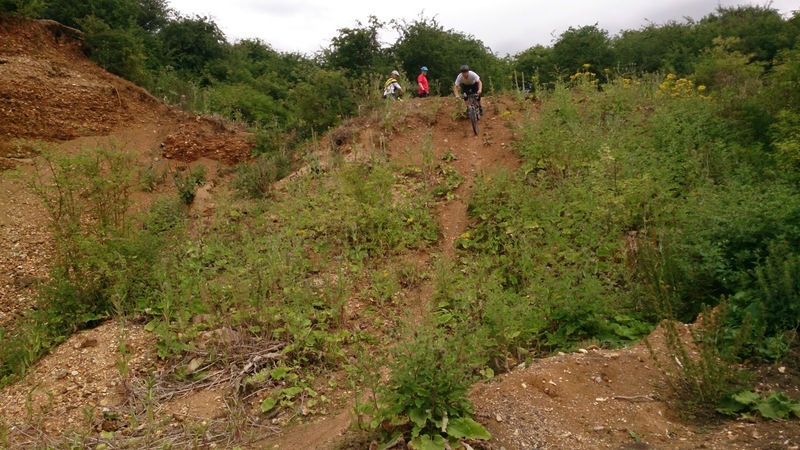 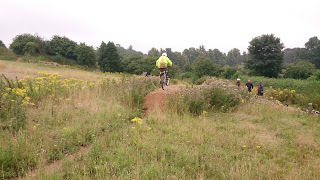 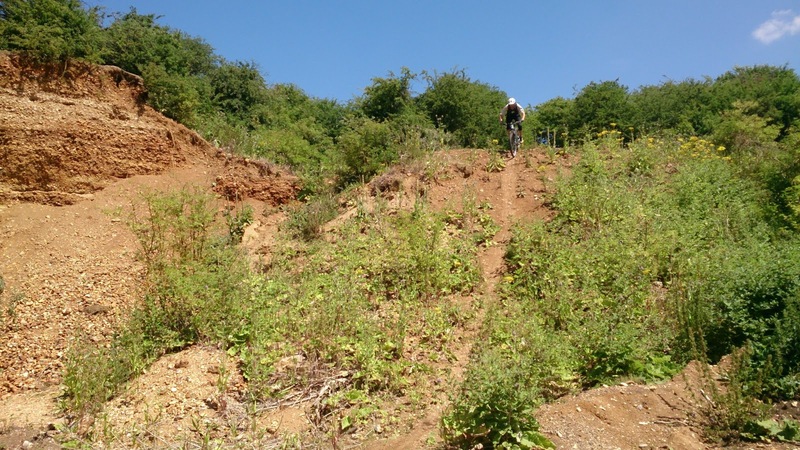 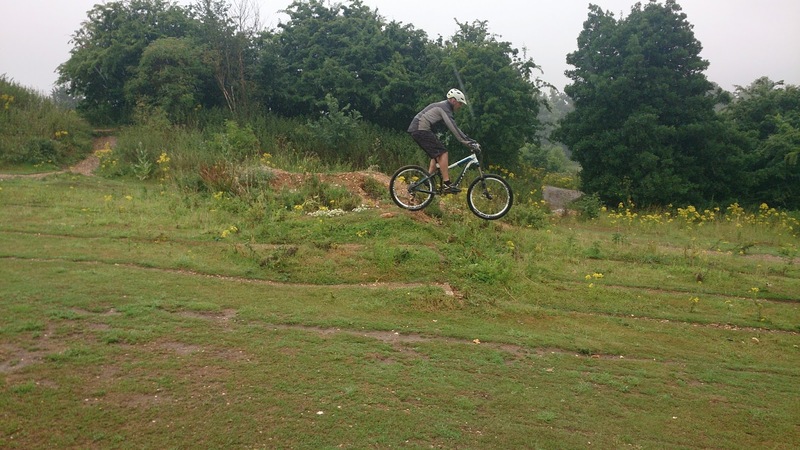 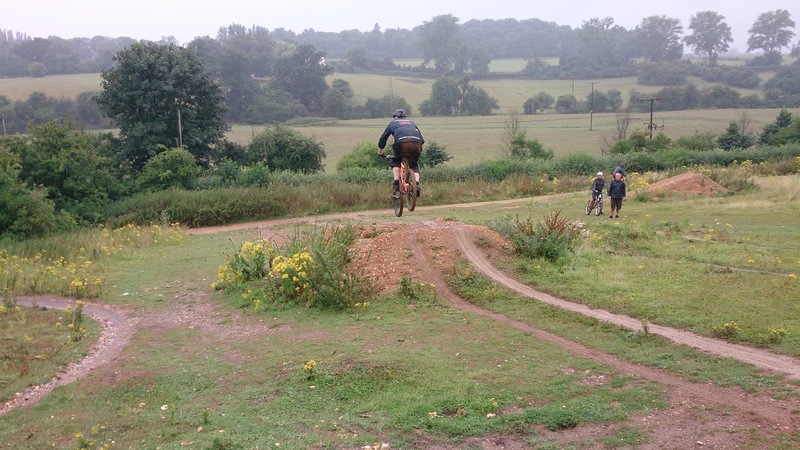 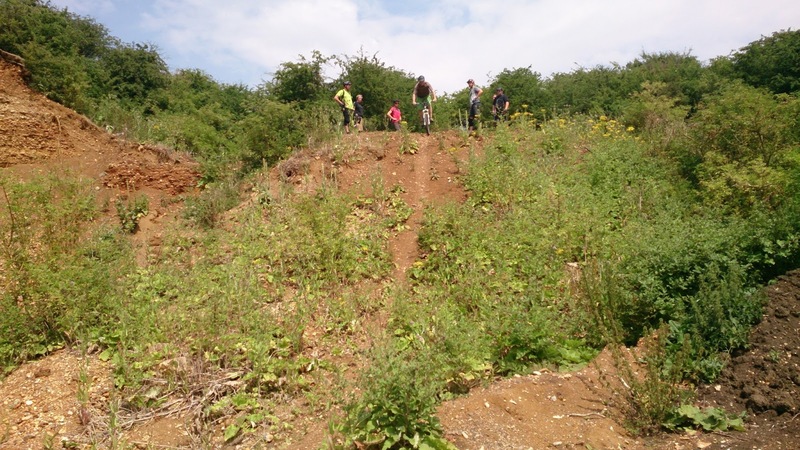 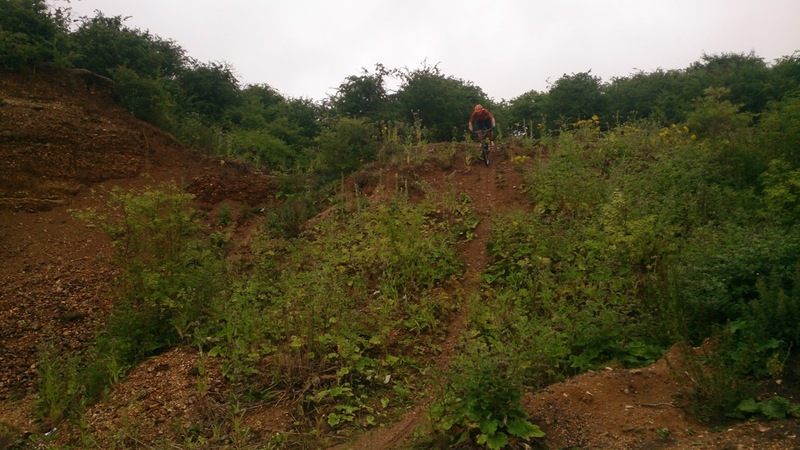 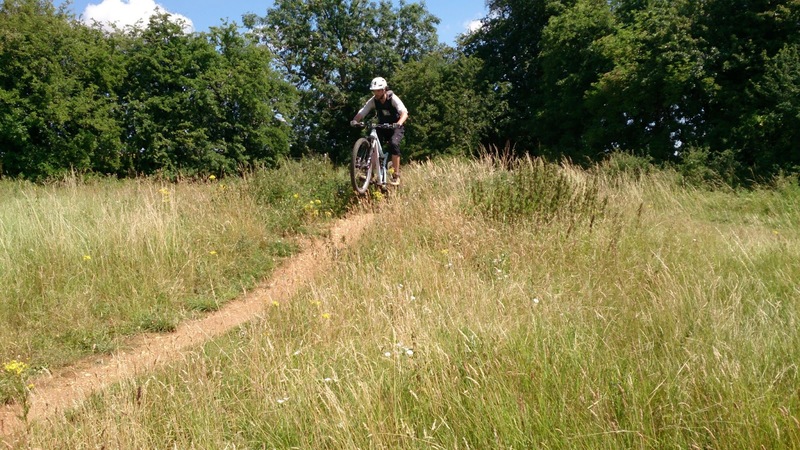 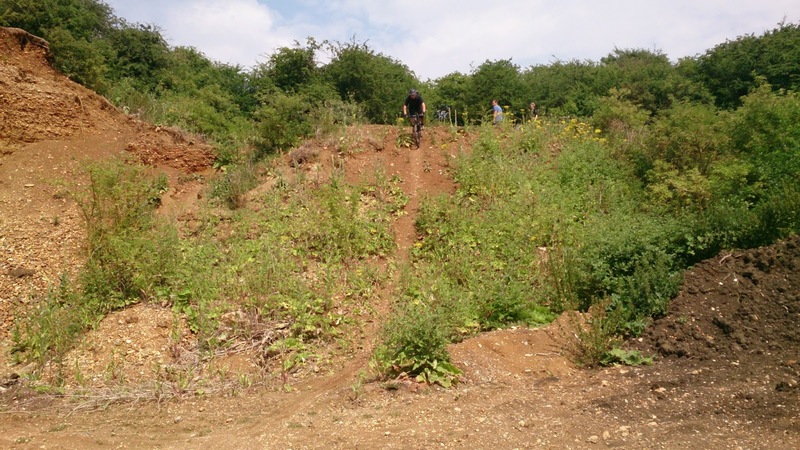 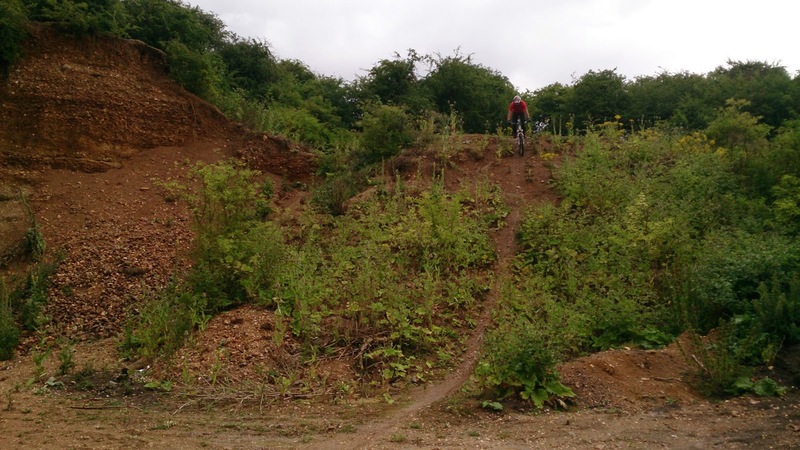 Here, we worked down section by section, and both Simon and Phil where riding top to bottom linking both bermed and flat corners, rock gardens, fly outs, steps and drops. 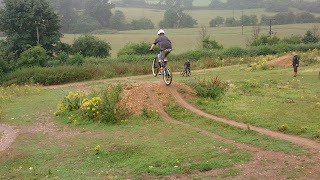 We then moved onto the table top, where I controlled their speed, and slowly increased how far across they were jumping. 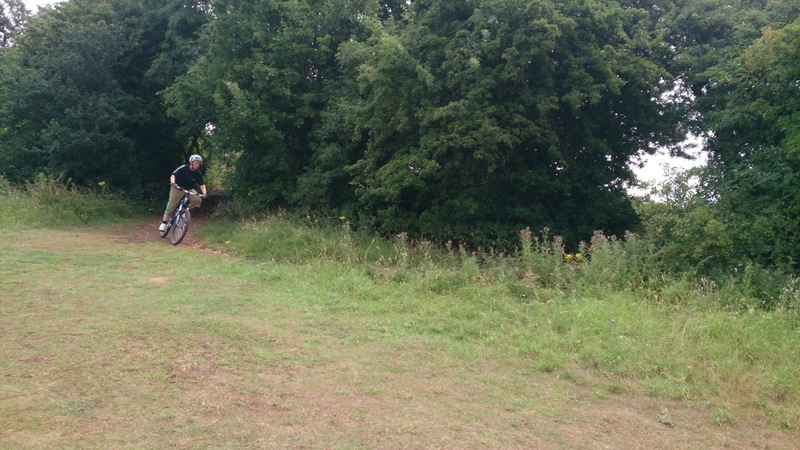 Mental and physical tiredness brought our session to an end, and I look forward to hearing how the riding is going. 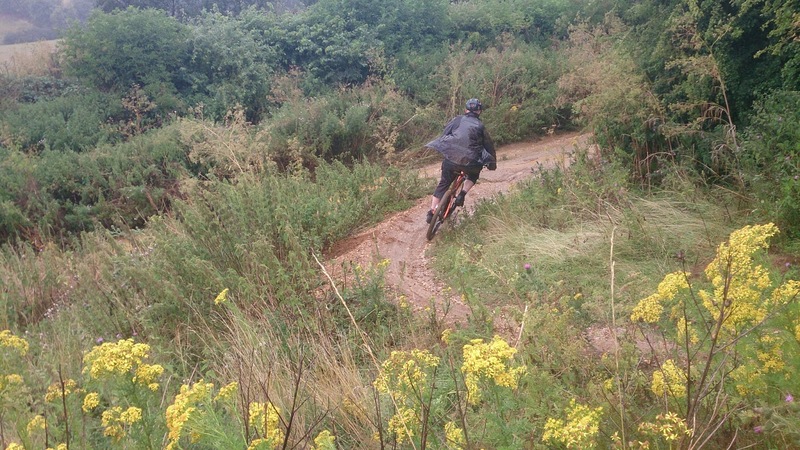 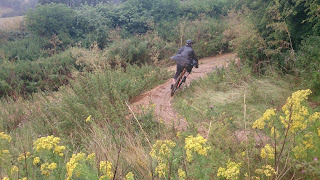 Pedro came to me wanting to get better all round but said he had an issue riding berms. 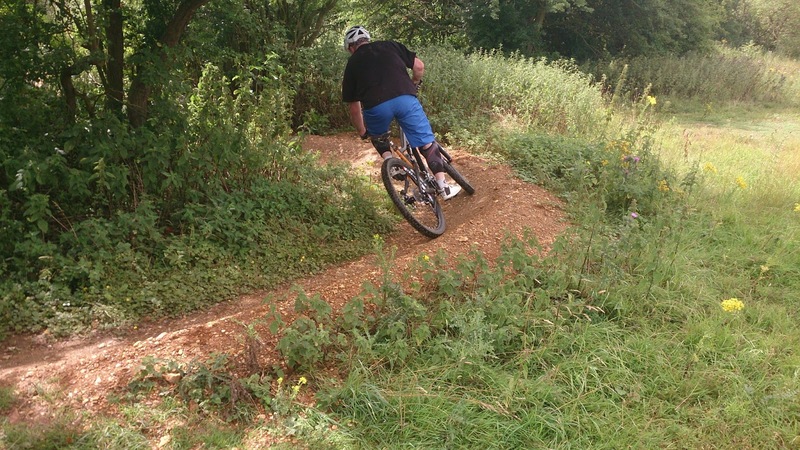 The skills check showed looking and body positioning faults and I showed him why I made a set up change. We began with drops and he quickly felt at ease on the largest. 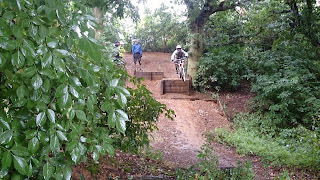 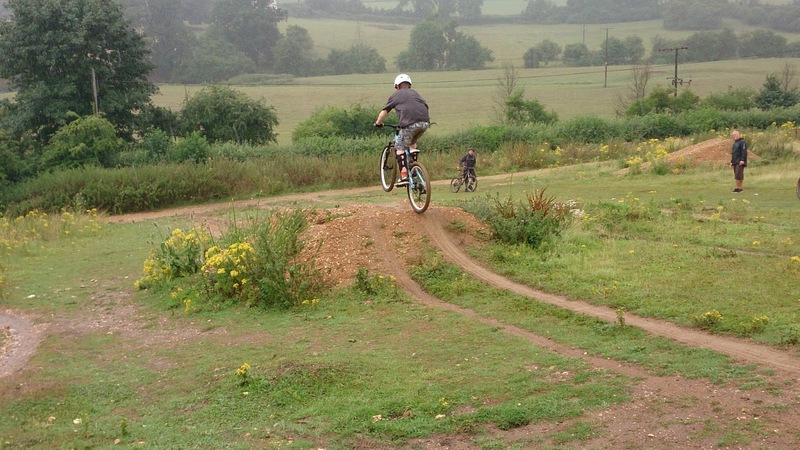 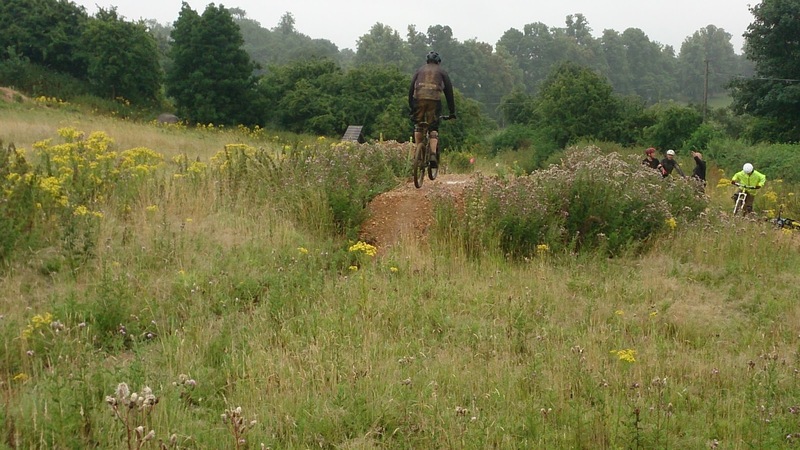 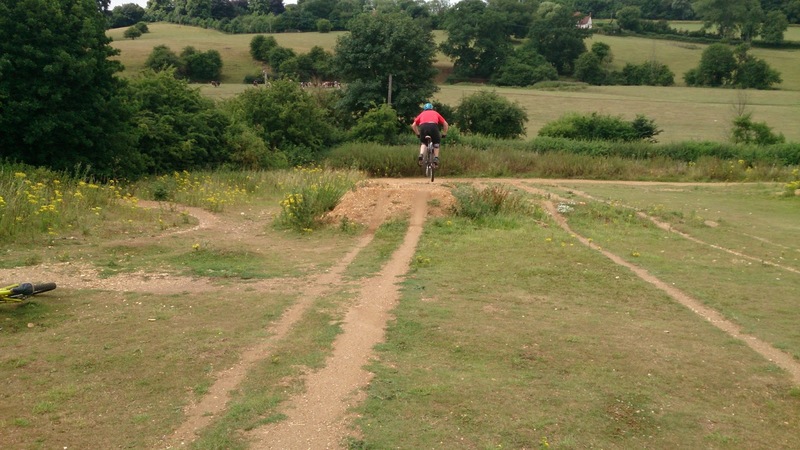 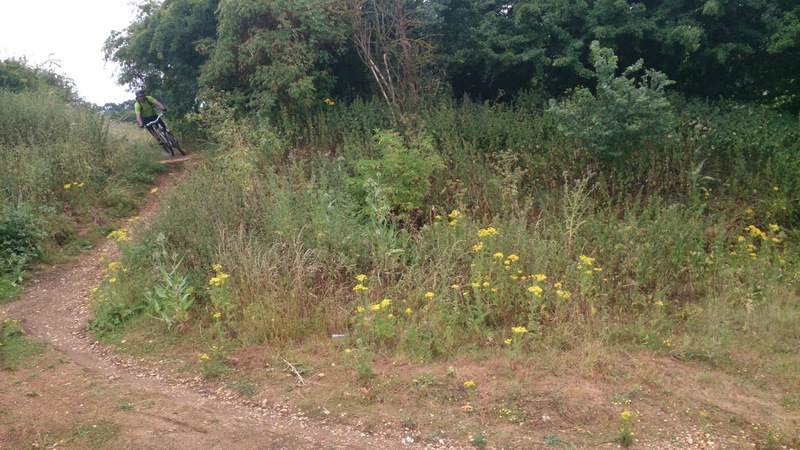 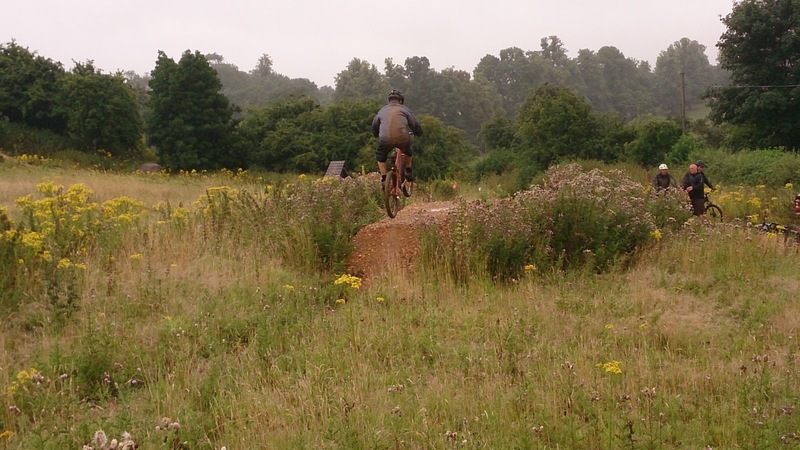 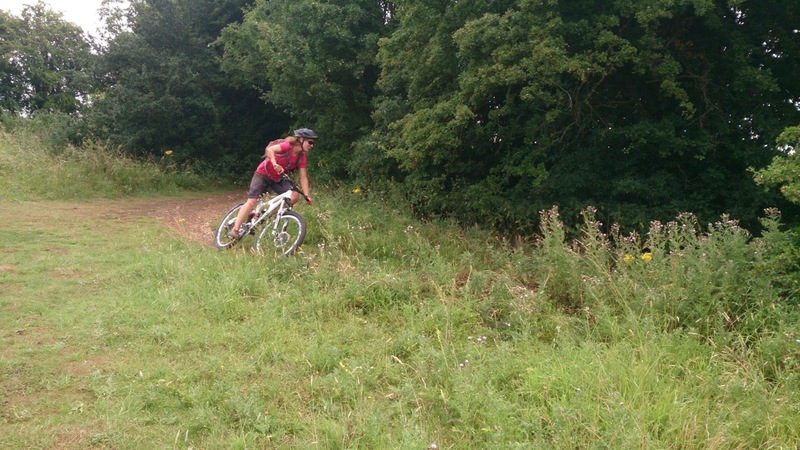 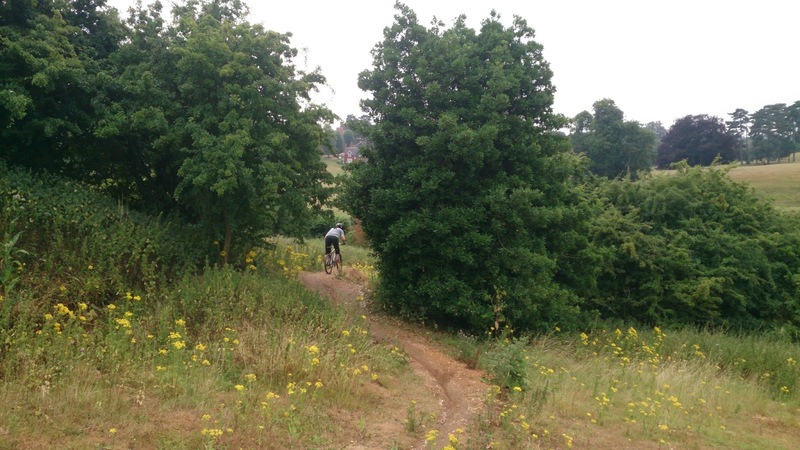 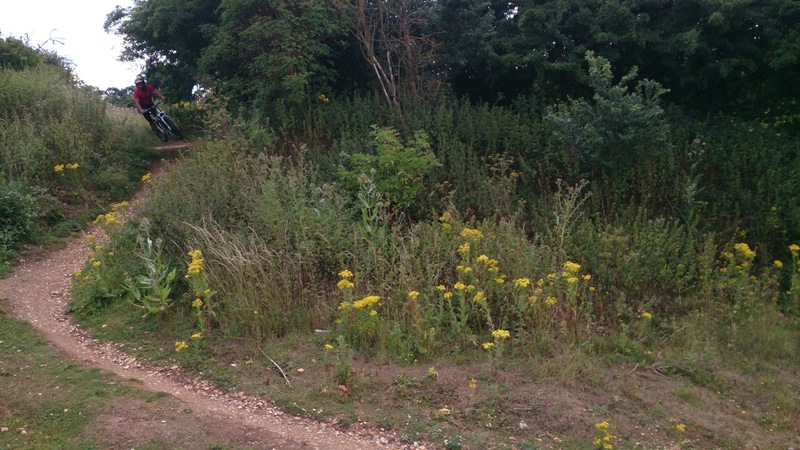 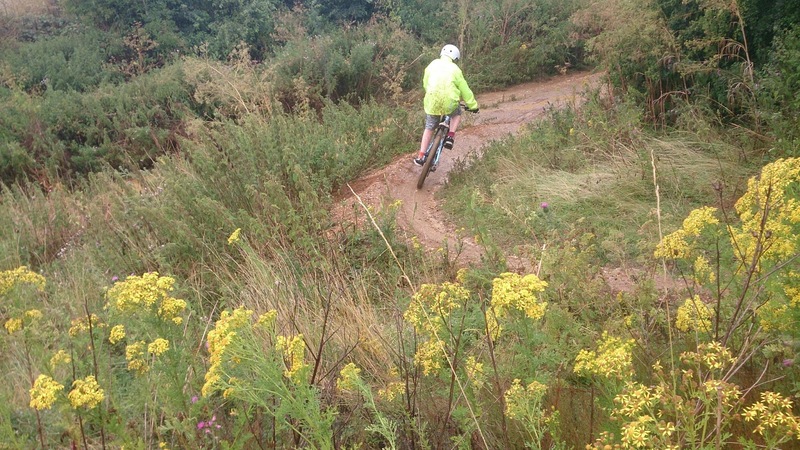 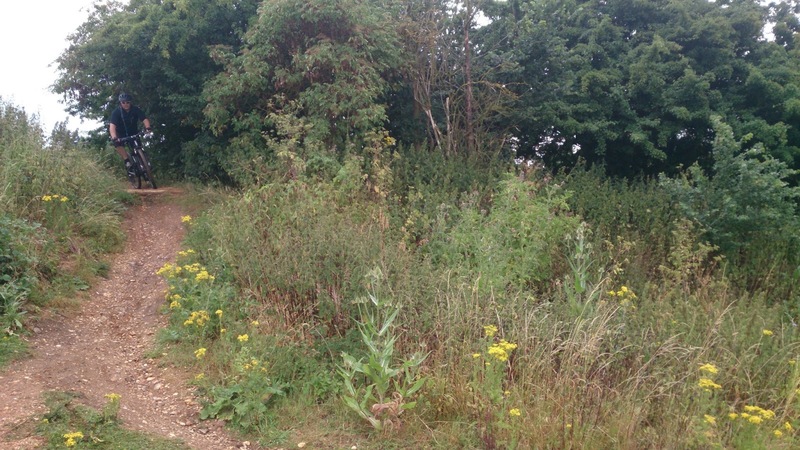 We moved to the skills trail and worked on linking the 14 sections contained within it together. 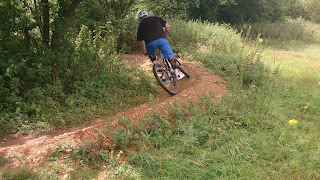 Pumping, absorbing, rocks, drops and steps were all linked to flat, bermed, off camber and switch back turns via line choice and control areas. 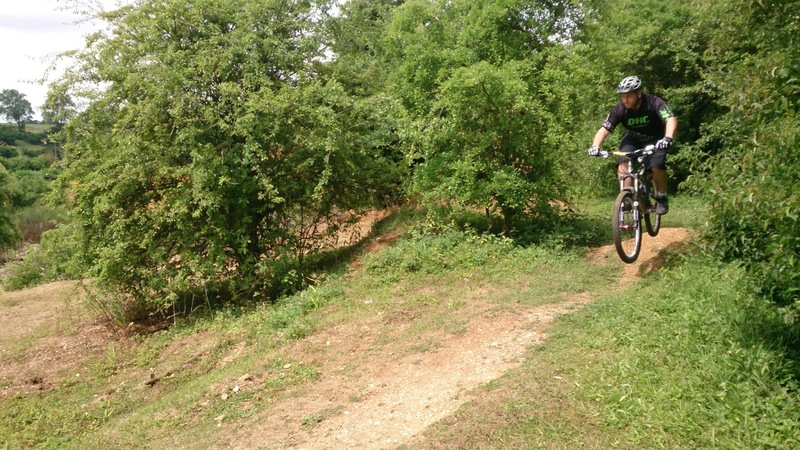 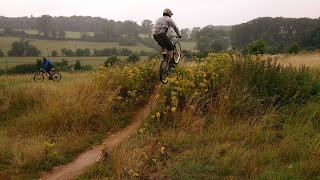 I worked on his mental skills during riding steeper terrain and he was stunned at how controlled everything now felt. 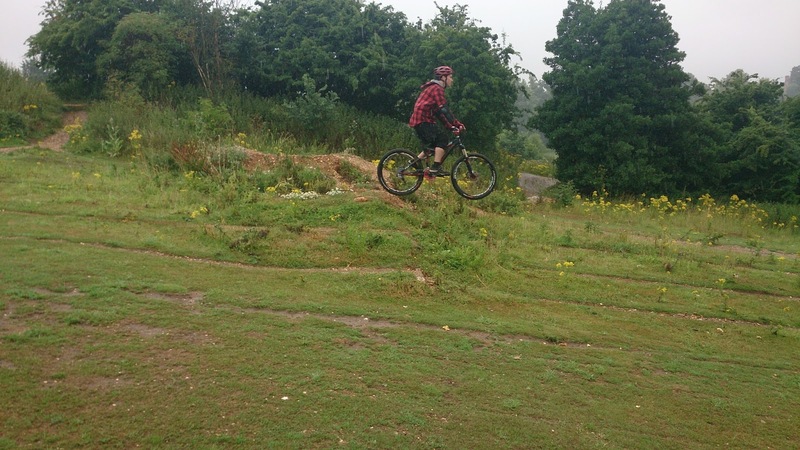 We took a break and resumed with jumping tabletops, I used a 6ft tabletop with a gap jump to the side of it for this and soon he was riding them both with comfort and ease. 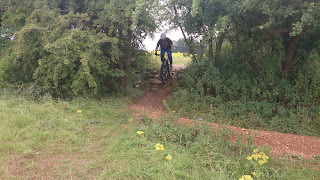 Any errors were now self diagnosed too! 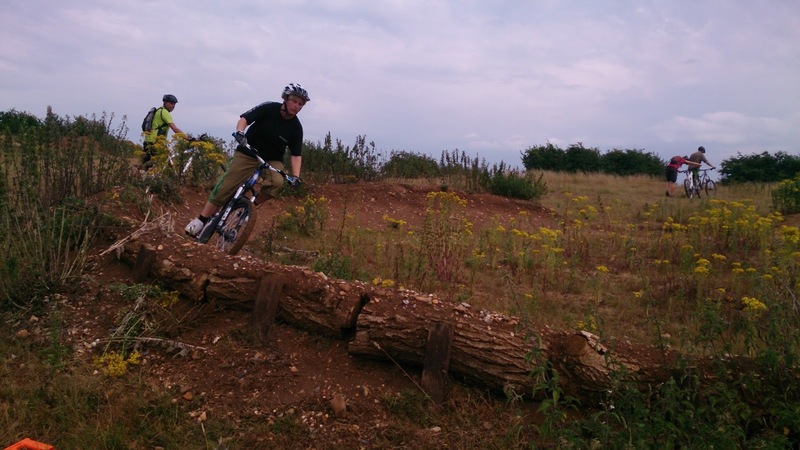 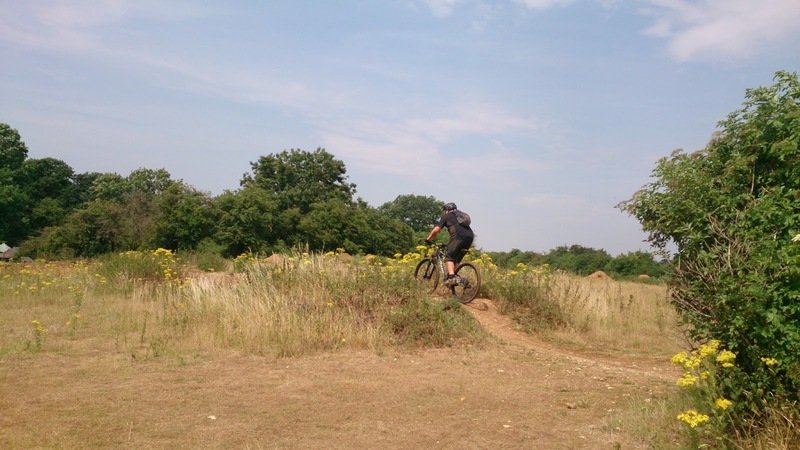 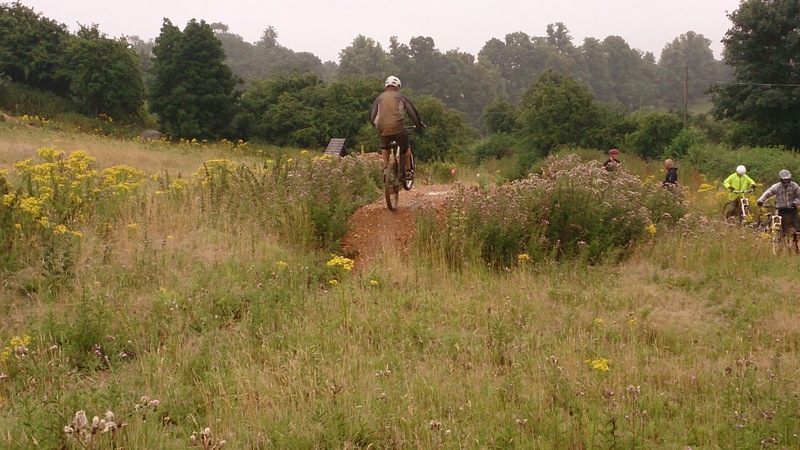 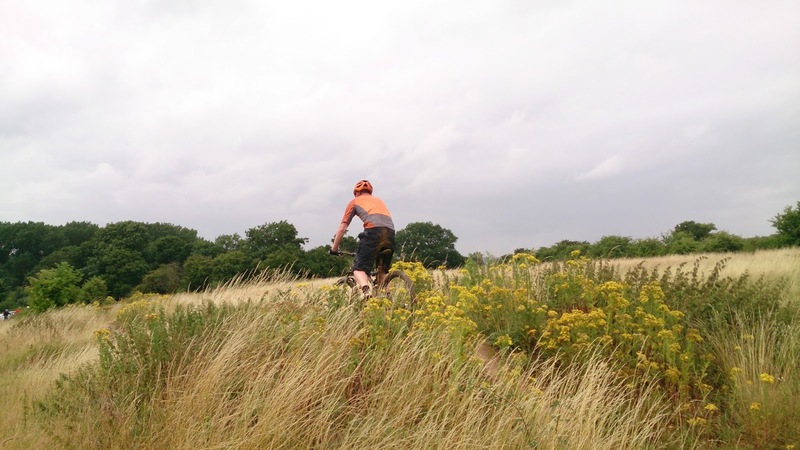 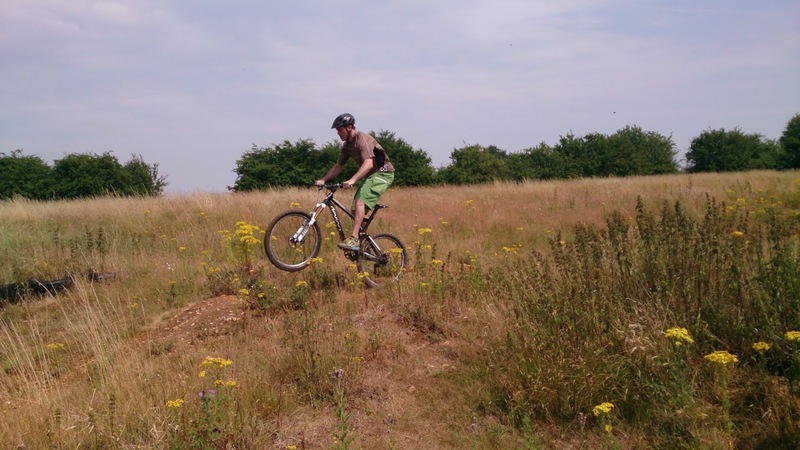 Next we moved to the pump and jump trail and developed his pumping of the trail further and choosing when to jump or pump sections on the trail, eventually linking 2 berms together easily and riding the wooden ladder gap jump after them too. 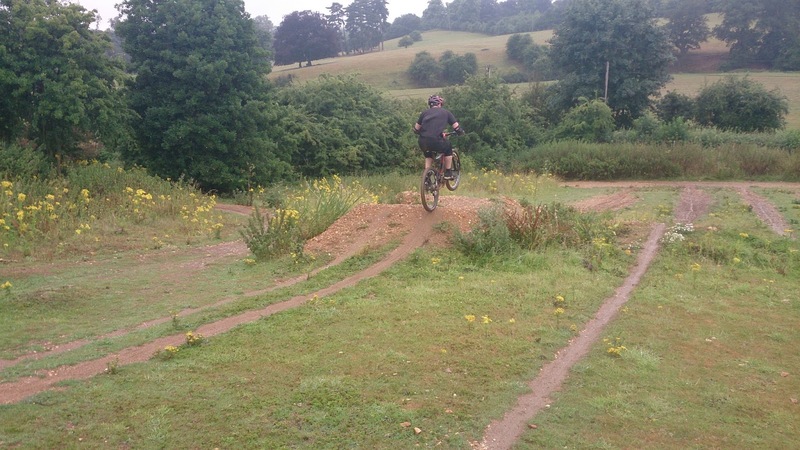 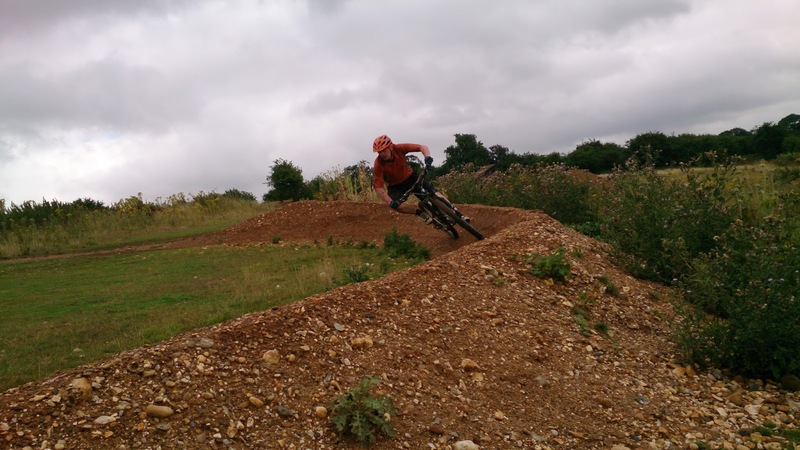 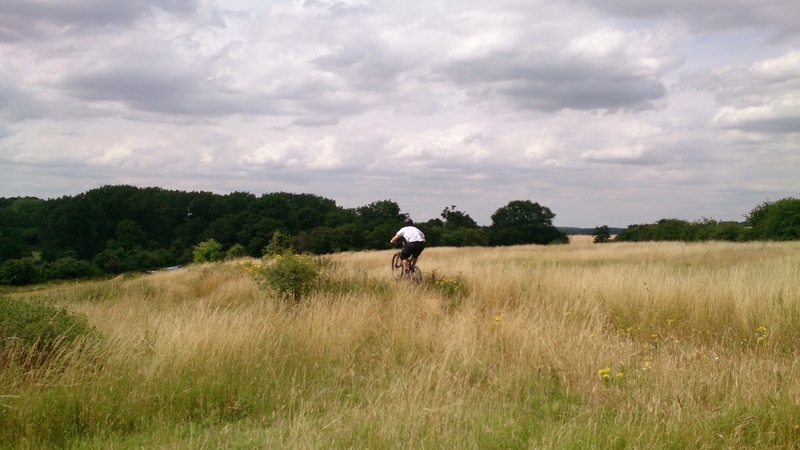 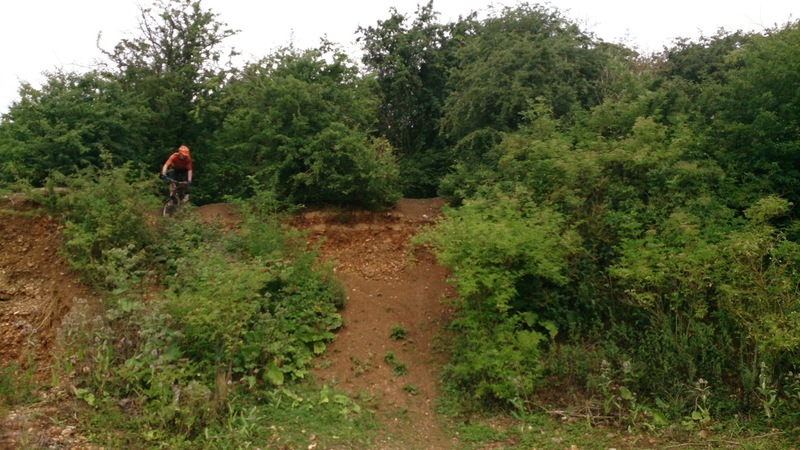 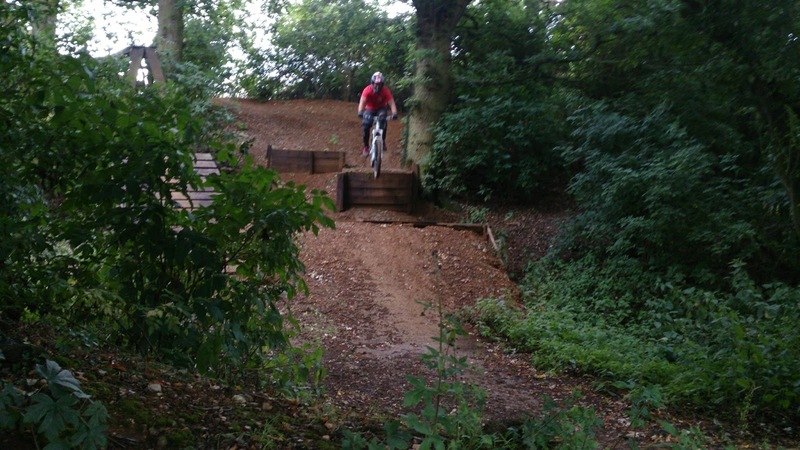 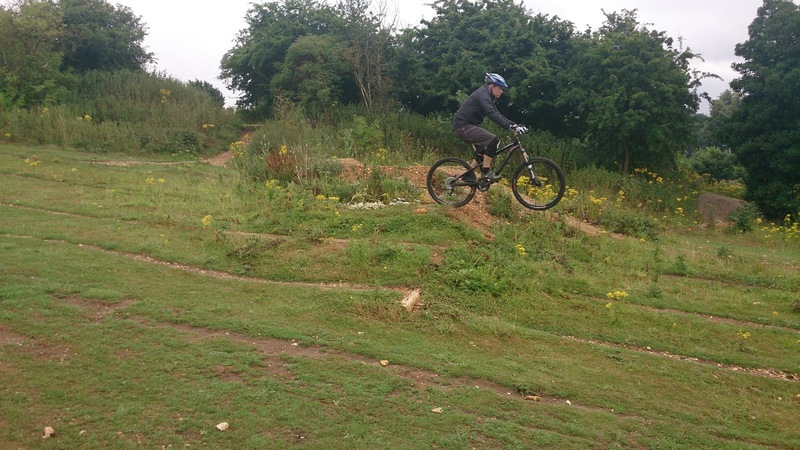 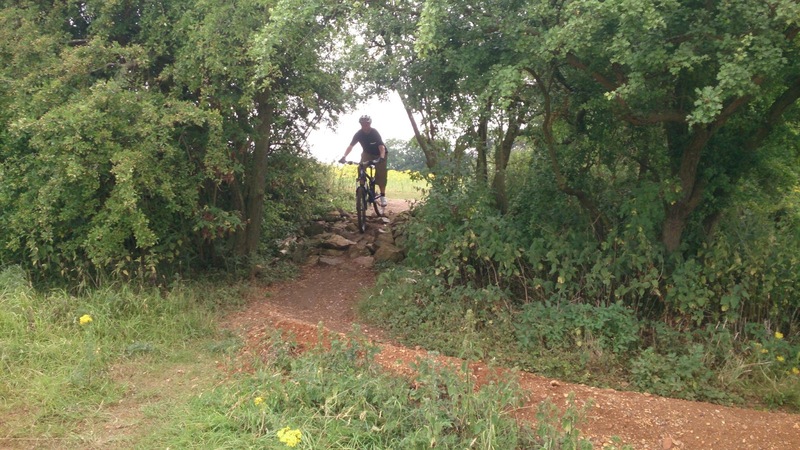 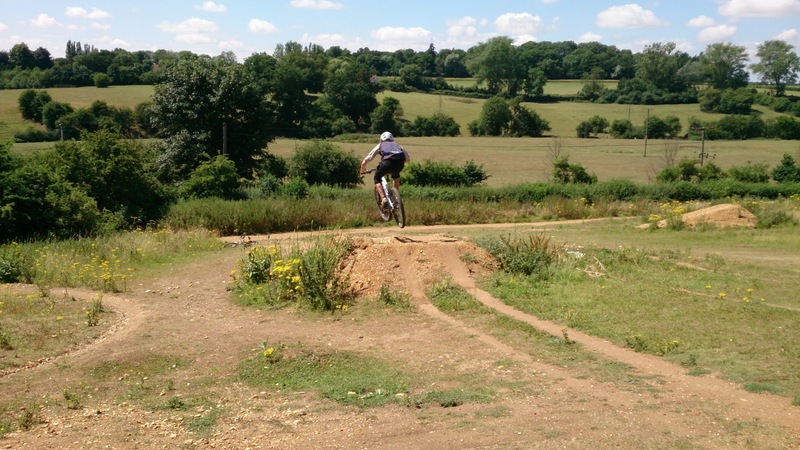 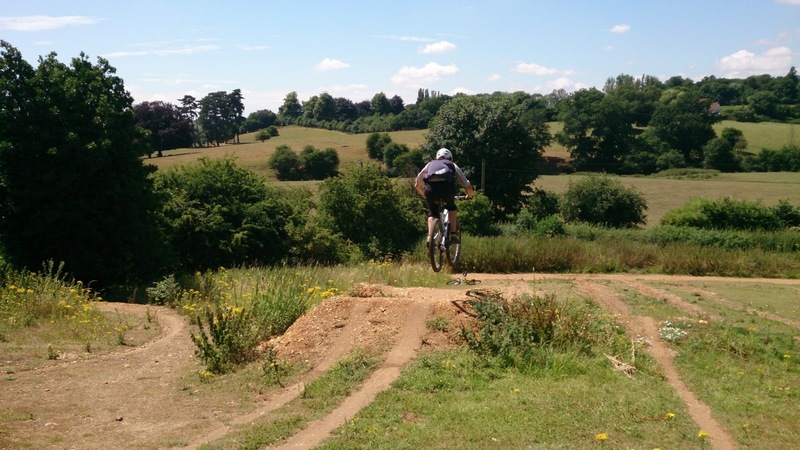 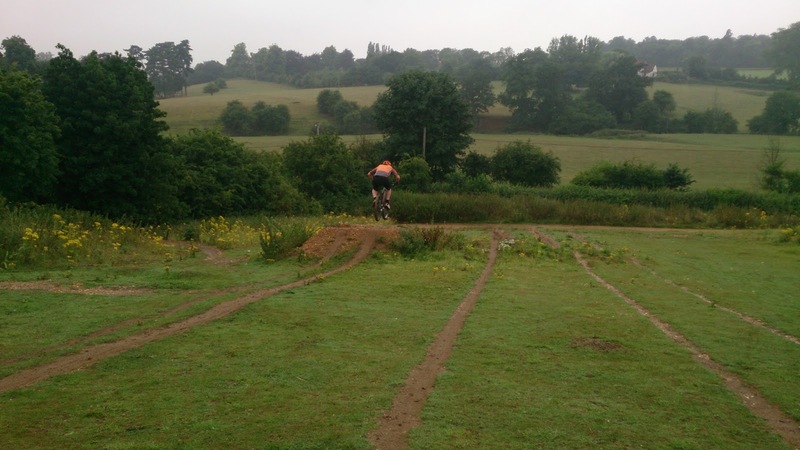 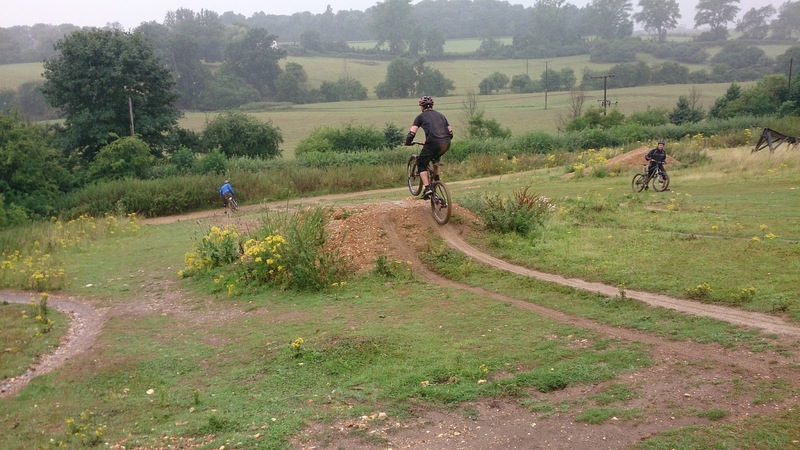 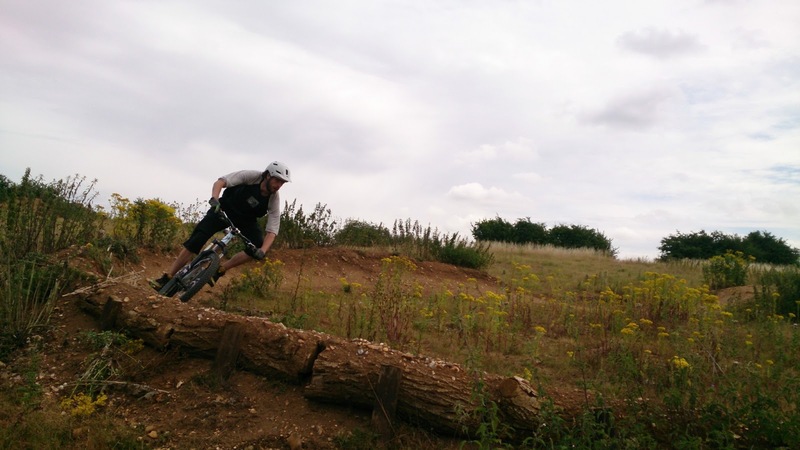 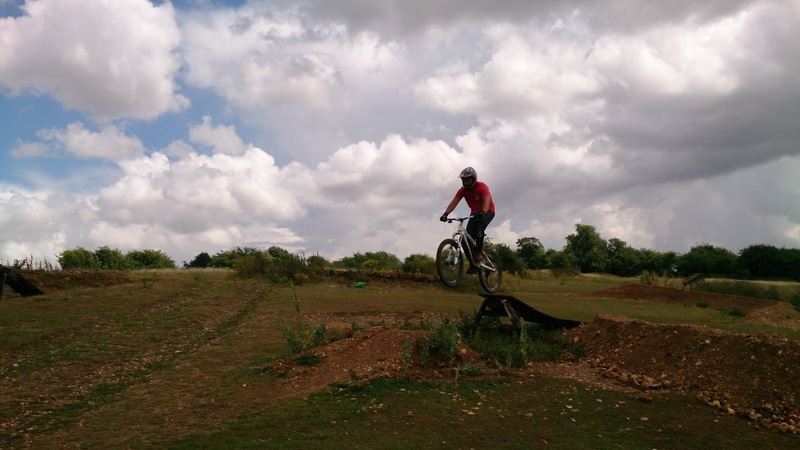 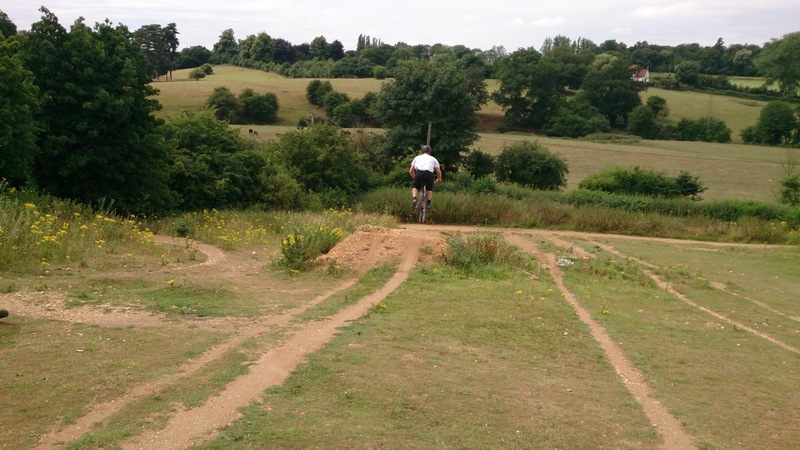 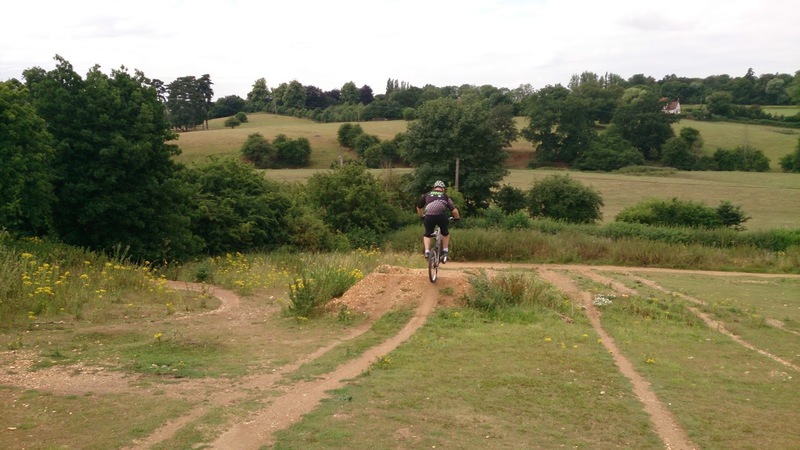 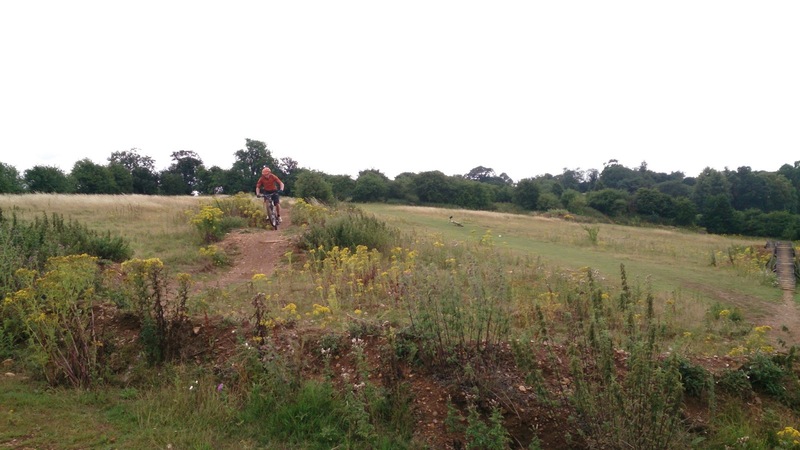 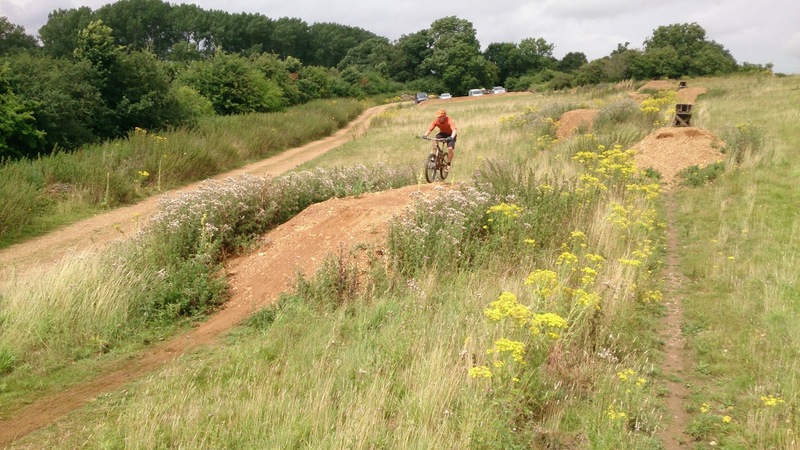 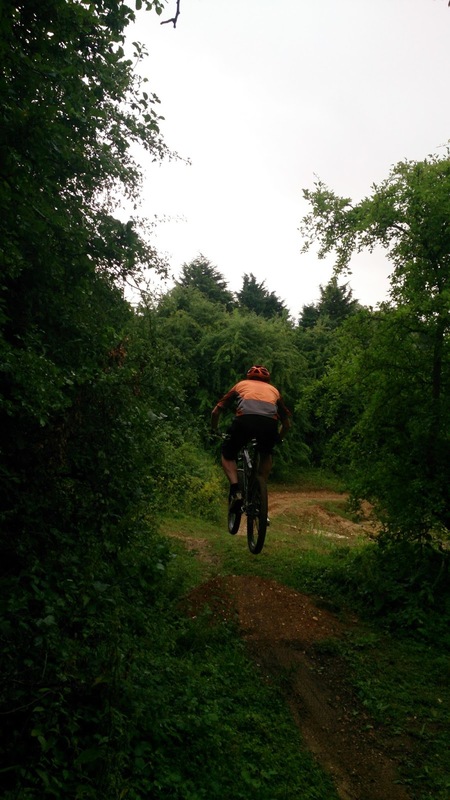 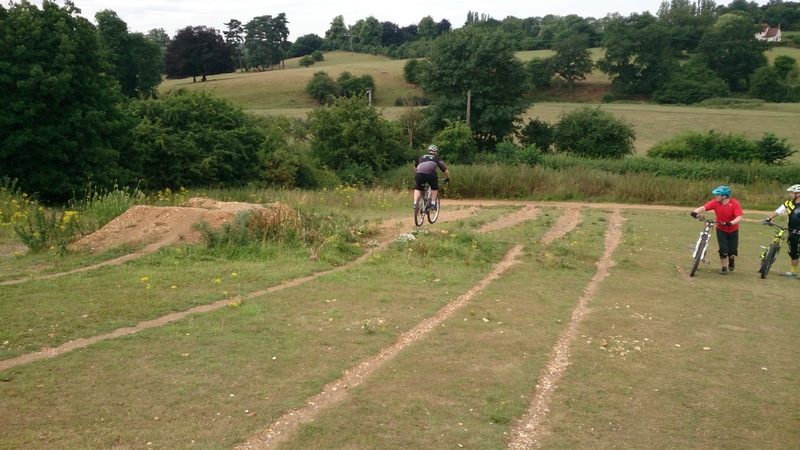 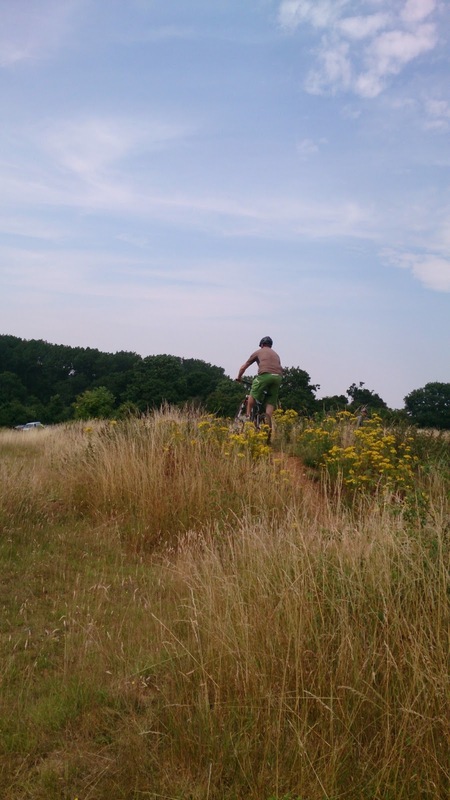 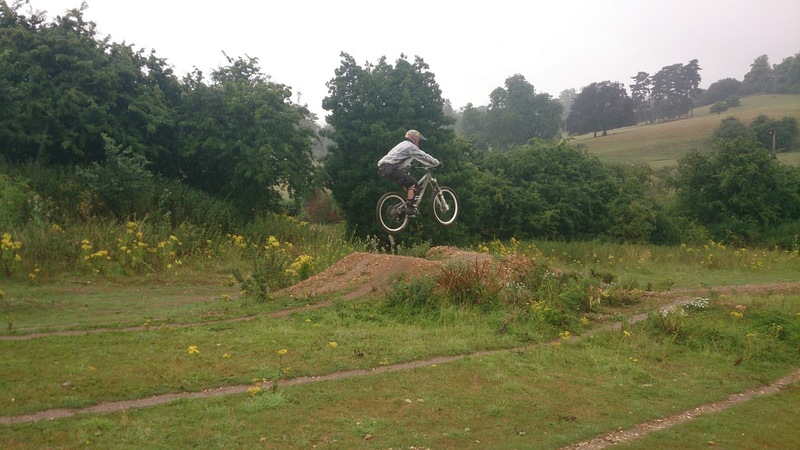 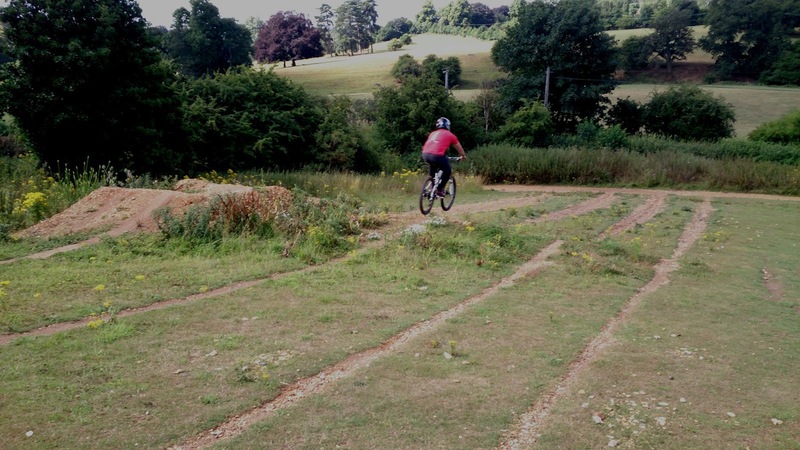 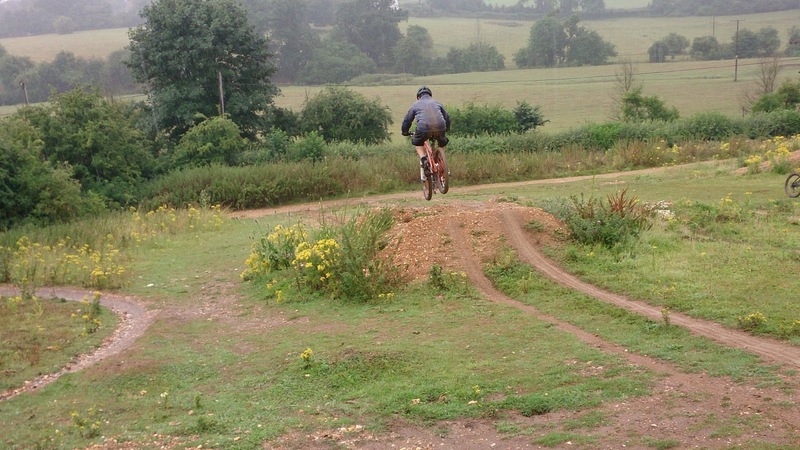 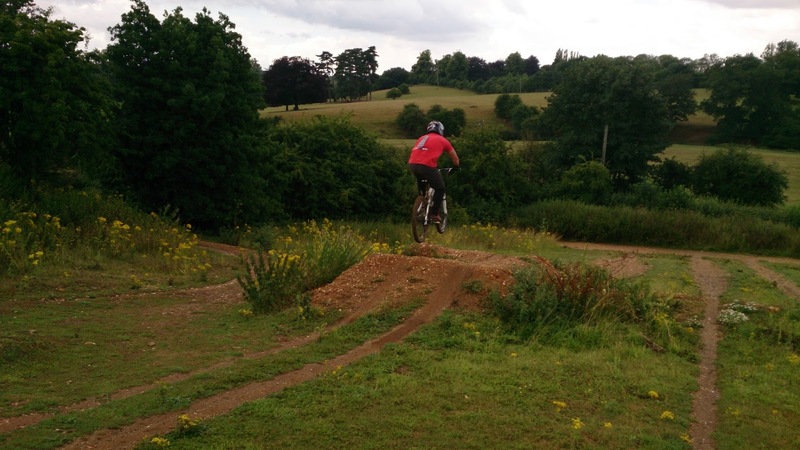 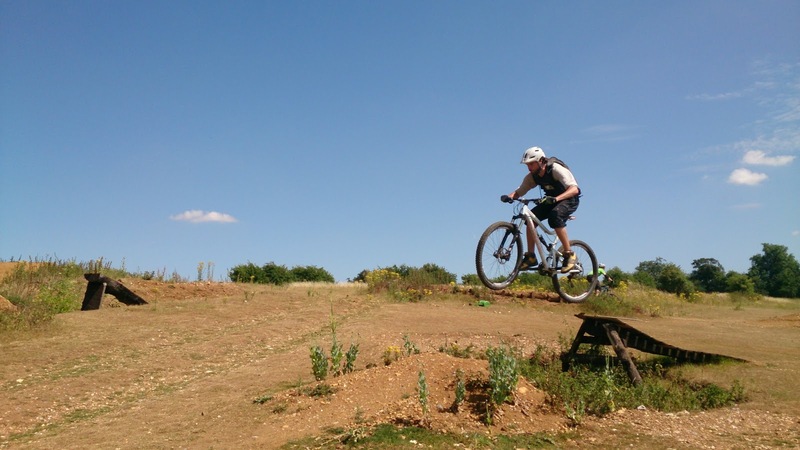 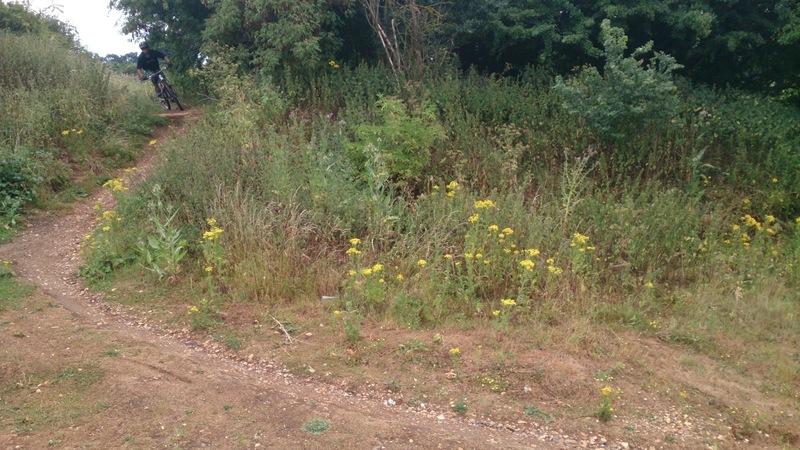 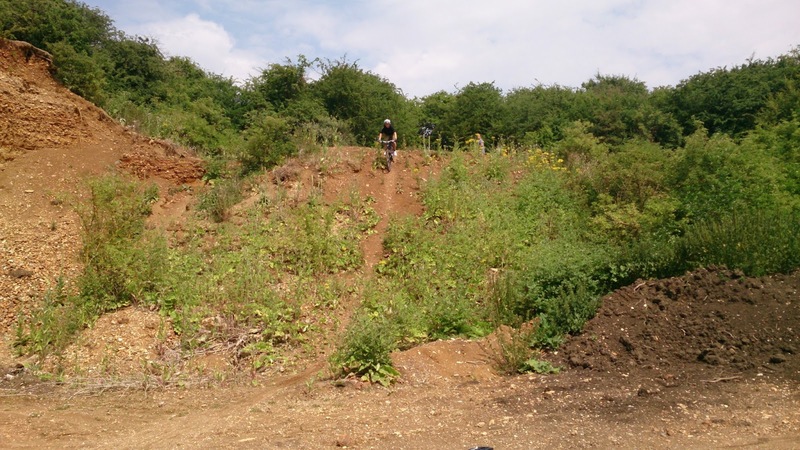 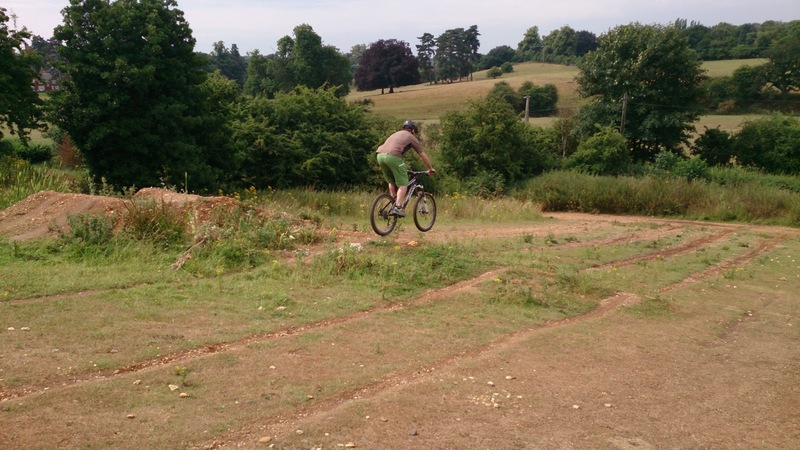 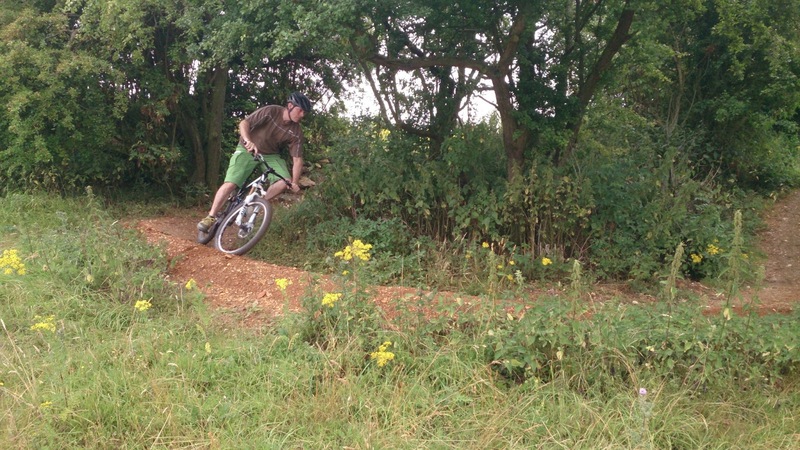 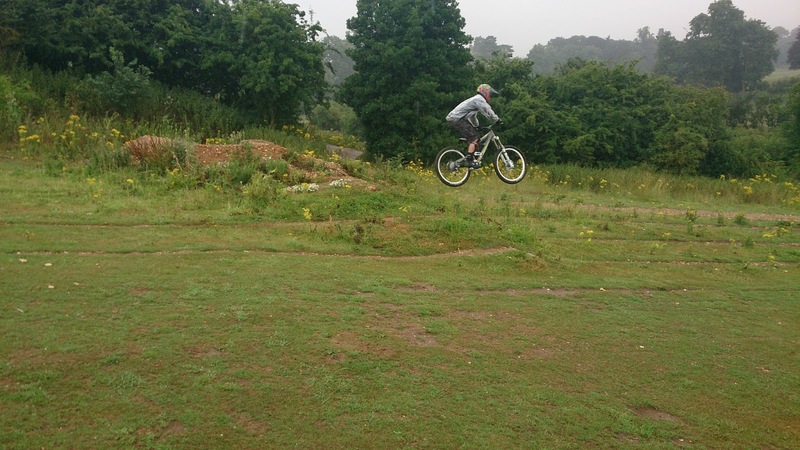 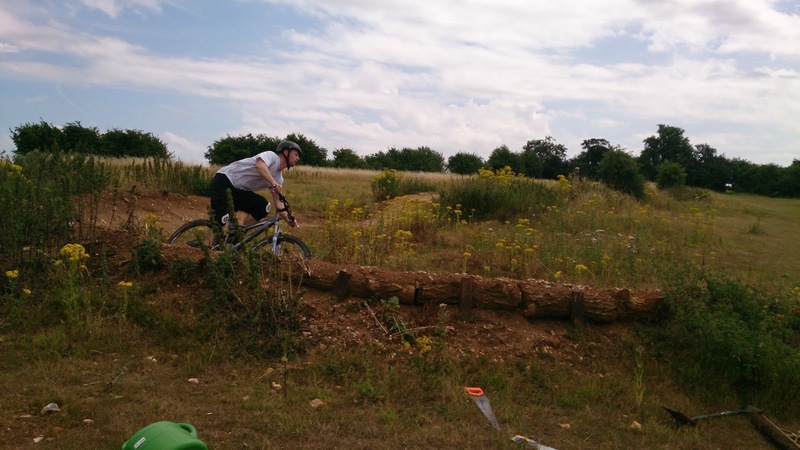 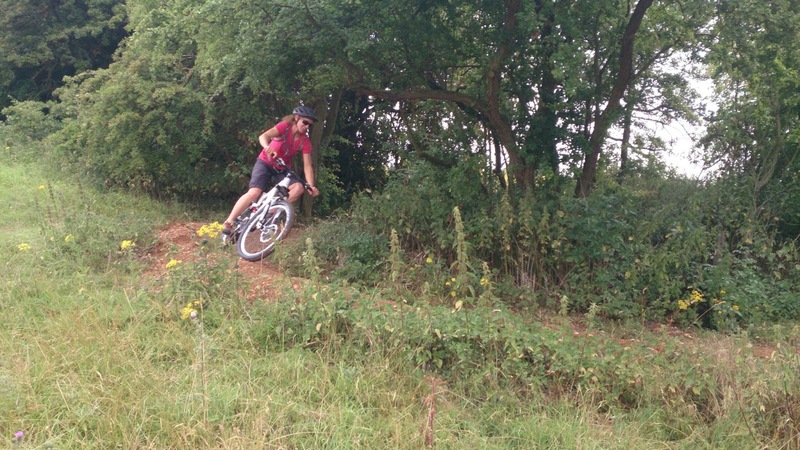 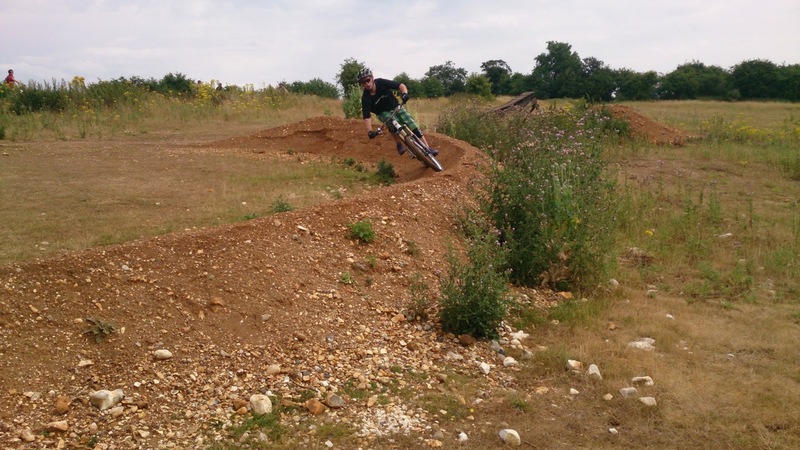 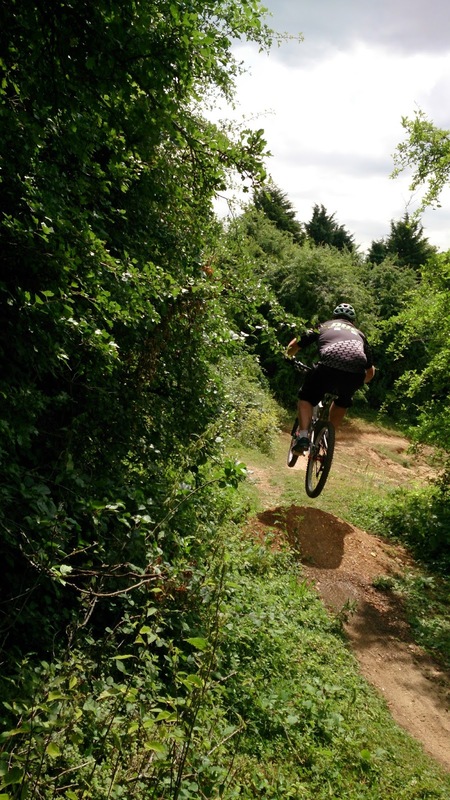 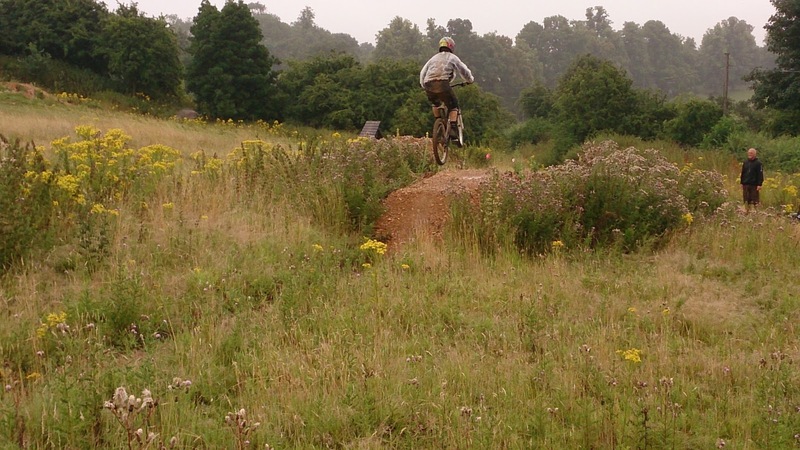 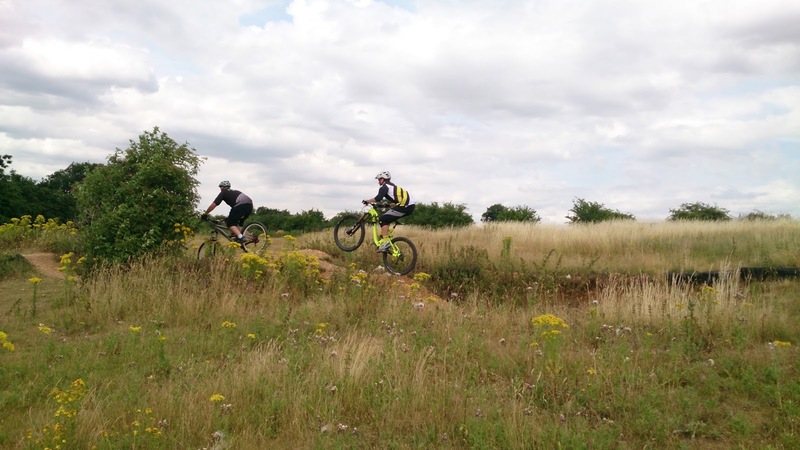 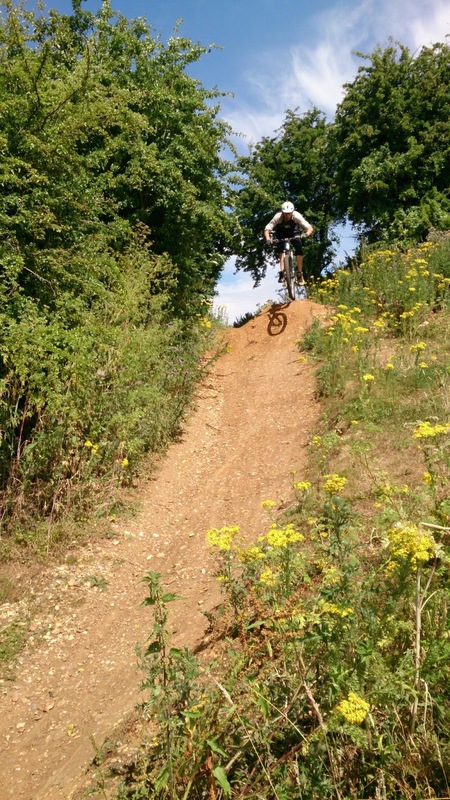 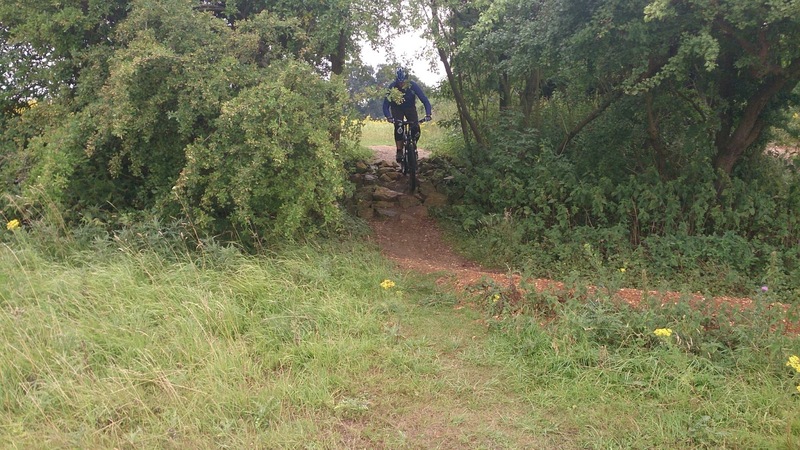 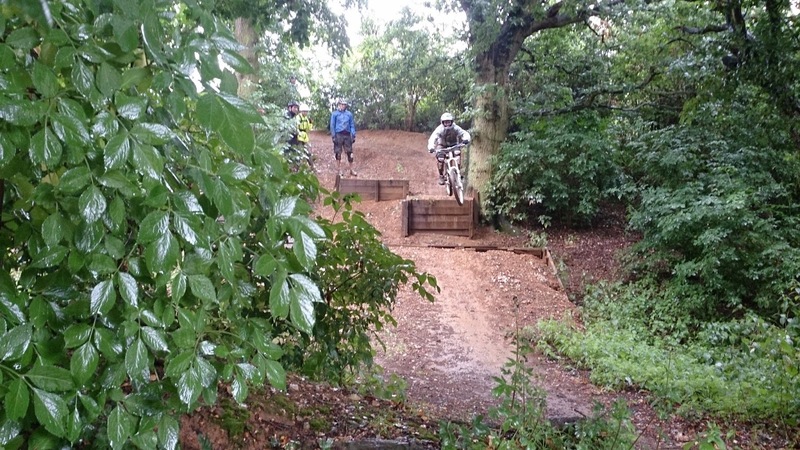 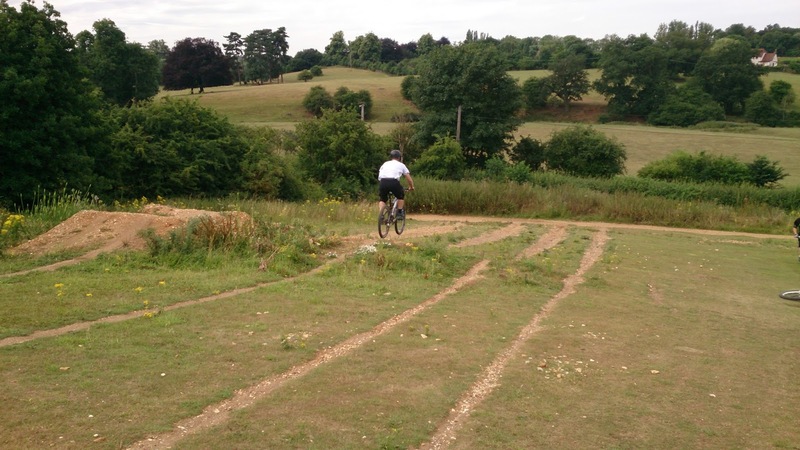 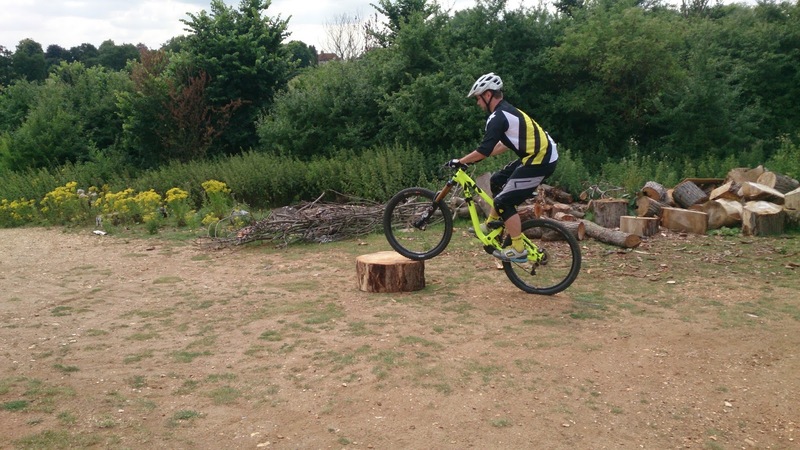 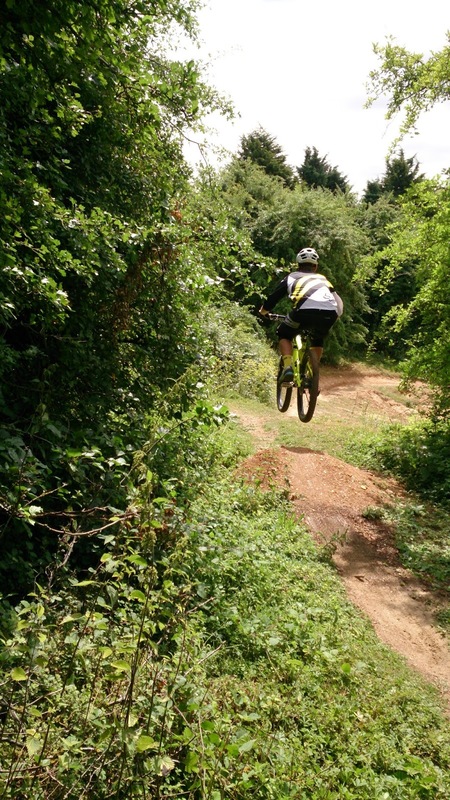 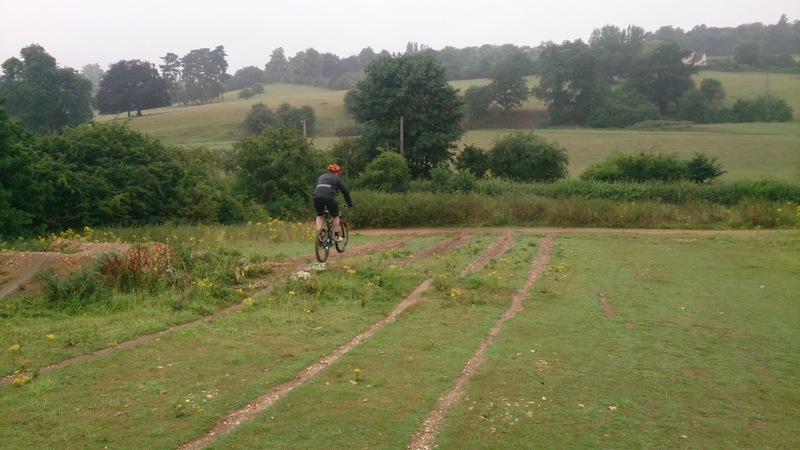 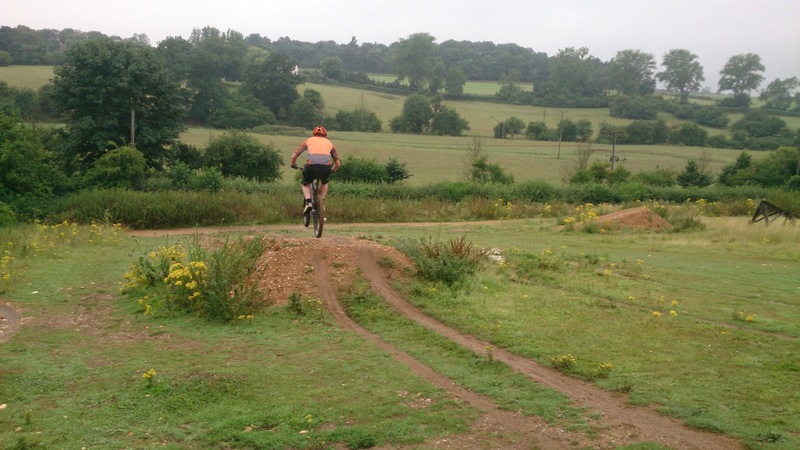 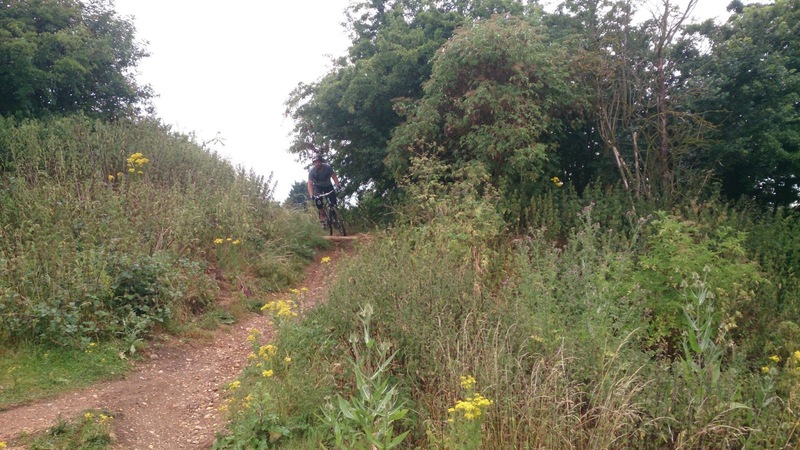 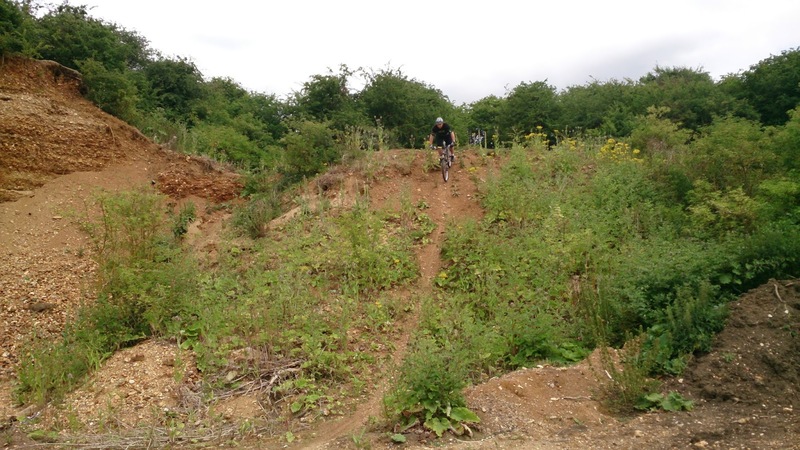 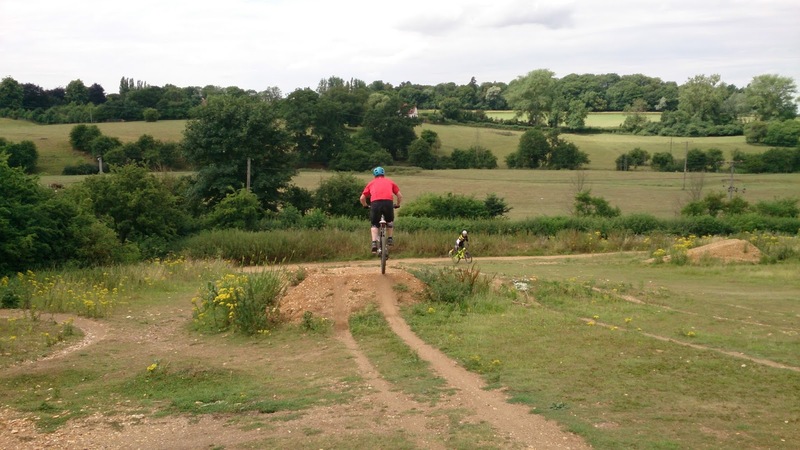 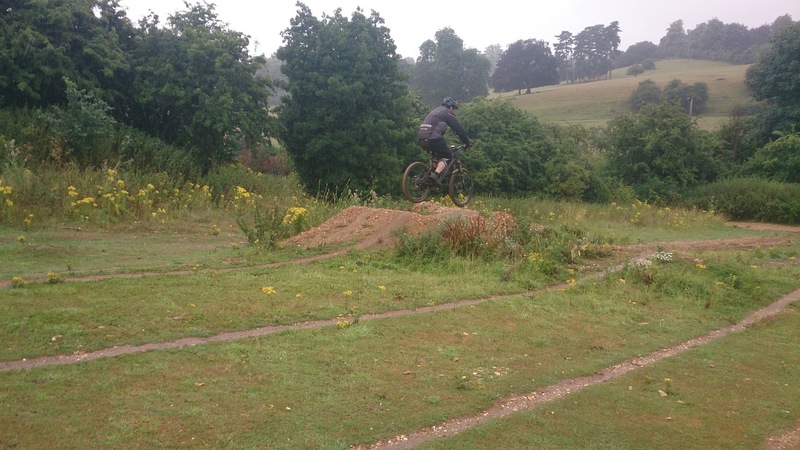 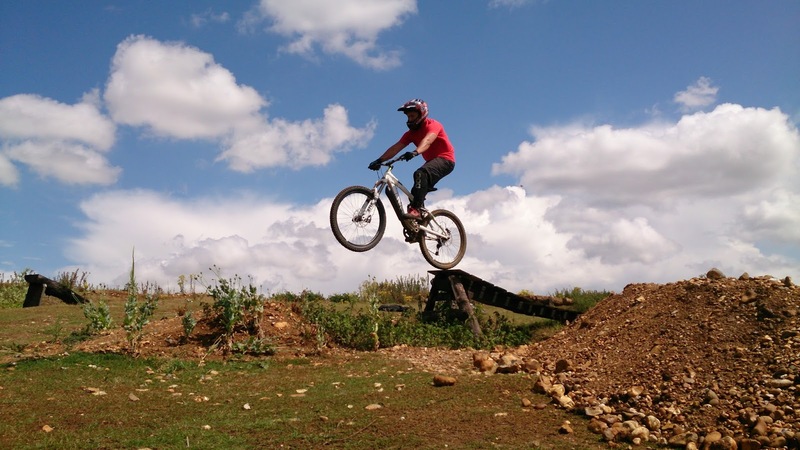 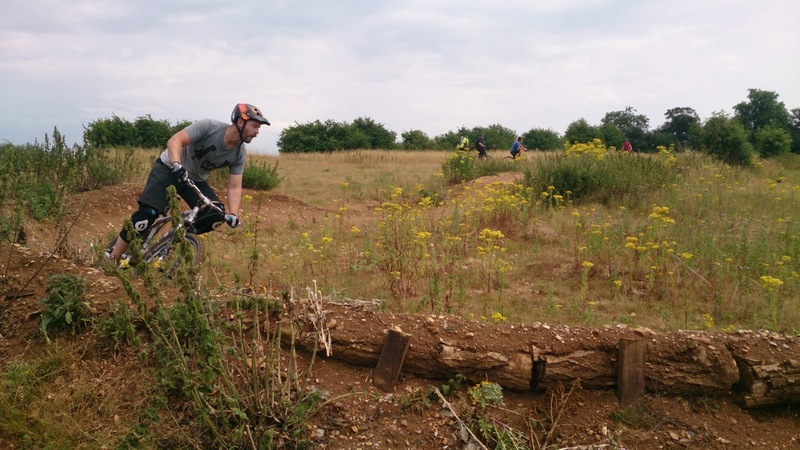 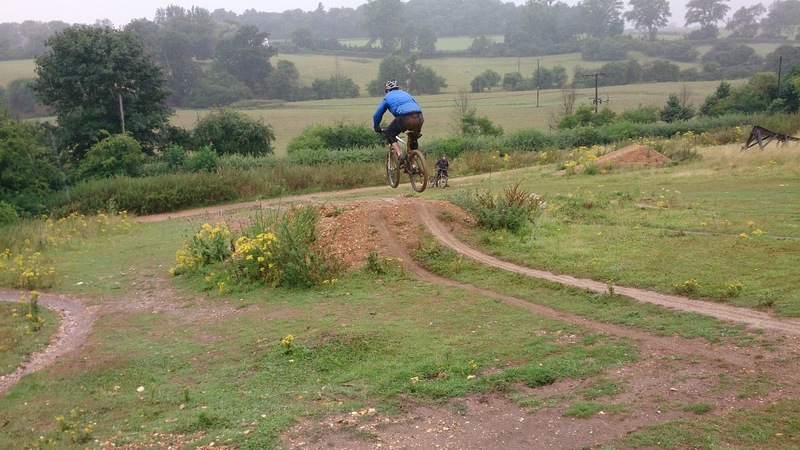 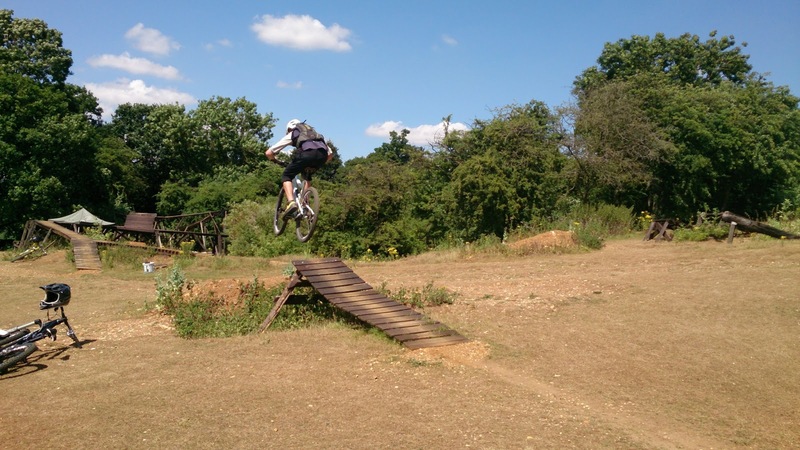 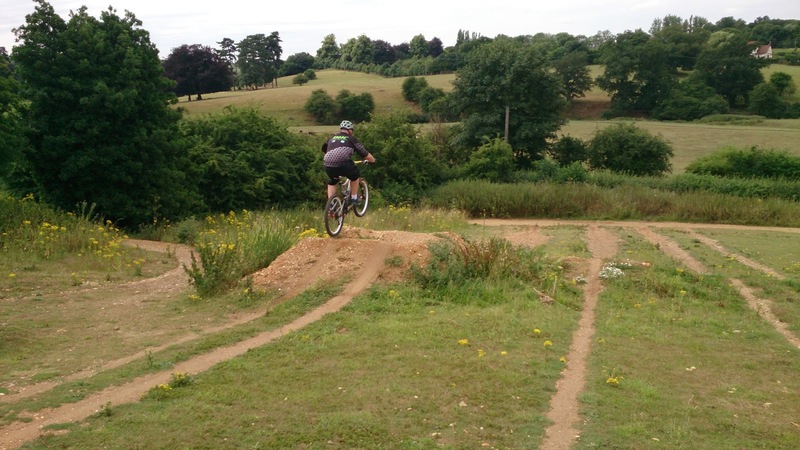 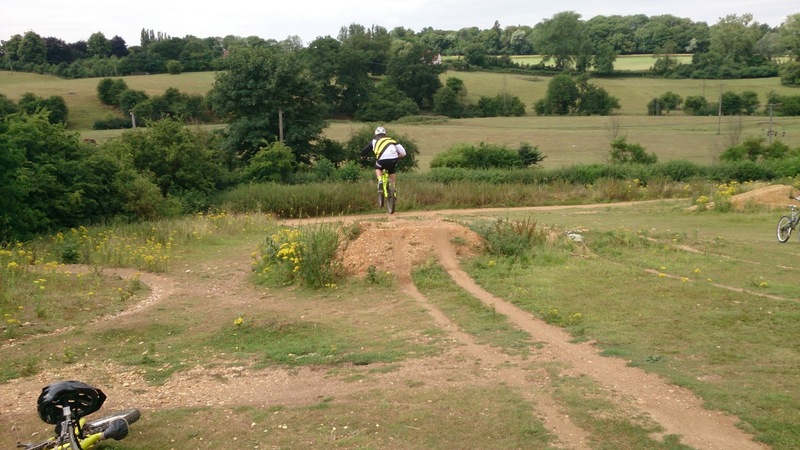 Lastly, we moved onto a more complex segment of linking 2 berms with a 9ft gap jump between them, Pedro rode it over and over until declaring himself mentally shattered and our session ended there and then. Alex, Jon ,James and Ali came to me from Bristol after Alex recommended me fro attending a public session. I found they needed work on looking, footwork and body positioning and I made some set up changes to assist this. We began with drops and they were amazed how easy it felt and I also showed why the mental and physical skills make it possible to style it too. From there we moved to the 6ft tabletop and gap jump and in a few small moves they were sailing over it and the gap too. 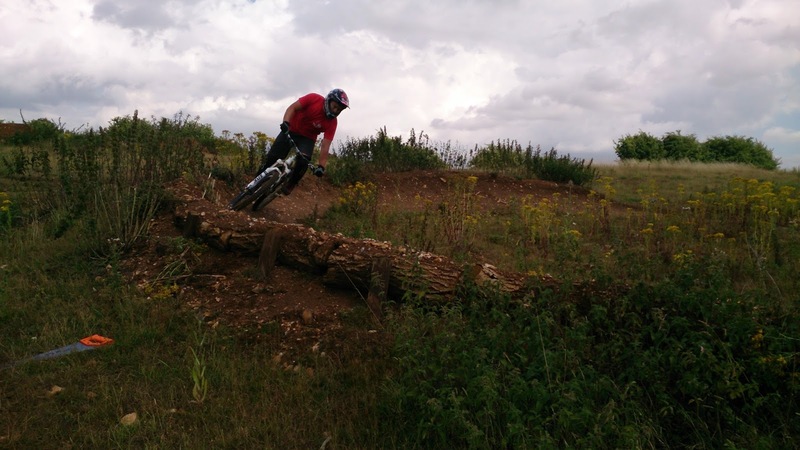 We took a break after working on applying the skills to riding berms and on resuming we moved to another trail to work on riding steeper terrain, and linking jumps, pumping and corners. 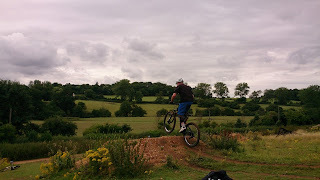 They were blown away at how easy it all felt and how much more controlled too. Next we moved onto the pump and jump trail where we worked on pumping to generate speed and choosing whether to pump, jump or manual sections on a trail and link in 2 berms at the end also. 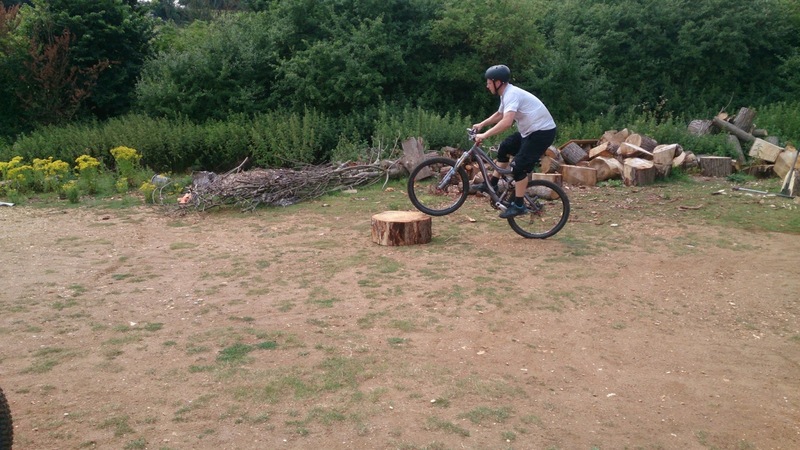 I knew they were tiring but I didn’t want to end the session til the last possible moment so we moved onto riding over logs using the skills sets and they all rode a large stump easily and much to their surprise. 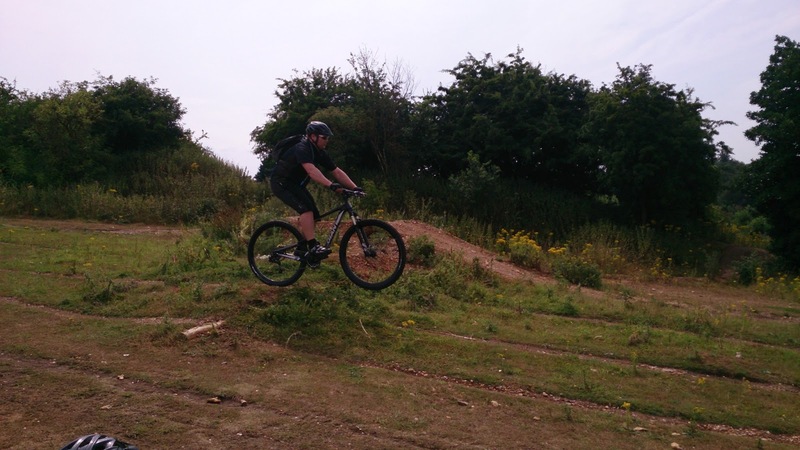 For our final application of the skills, I demonstrated linking a 9ft step down gap jump that is sandwich between 2 berms together and only Alex could answer yes to his mental skills questions and rode it over and over until mentally he was cooked and our session ended. 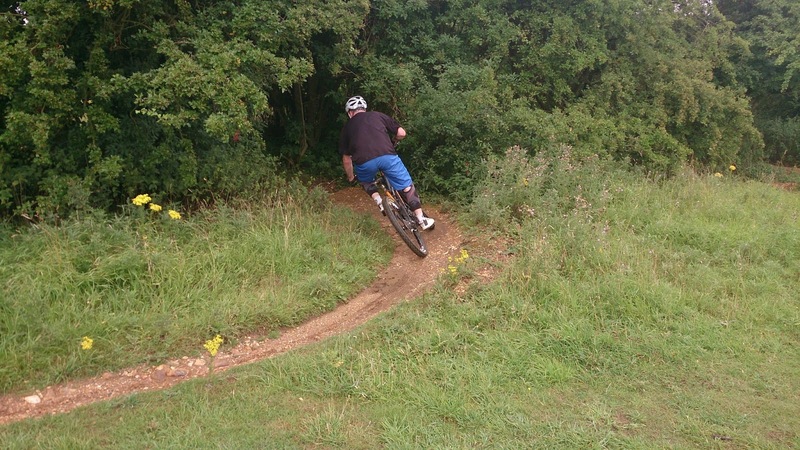 On meeting, I found that sam was missing body positioning and looking, so I began working on this with a set up change to assist me. 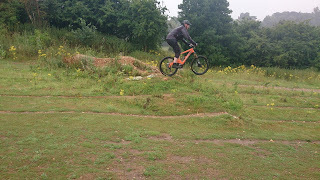 We quickly moved onto drops, where I explained the mental skills set, and he used this to be able to ride of the largest drop, and began styling it up in the air. I then took him to the top of the skills trail, where we worked on pumping, and linking this with both bermed and flat corners, and rock gardens. I then showed him two isolated berms, where I showed him how to carry speed through the two corners, and he was soon riding them well. 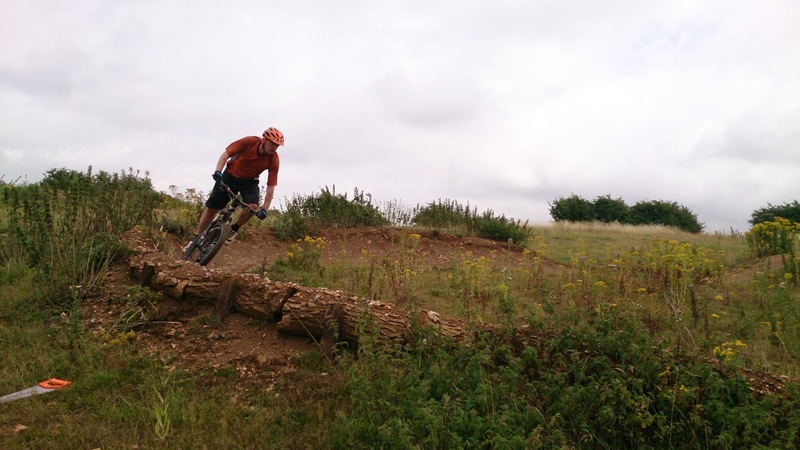 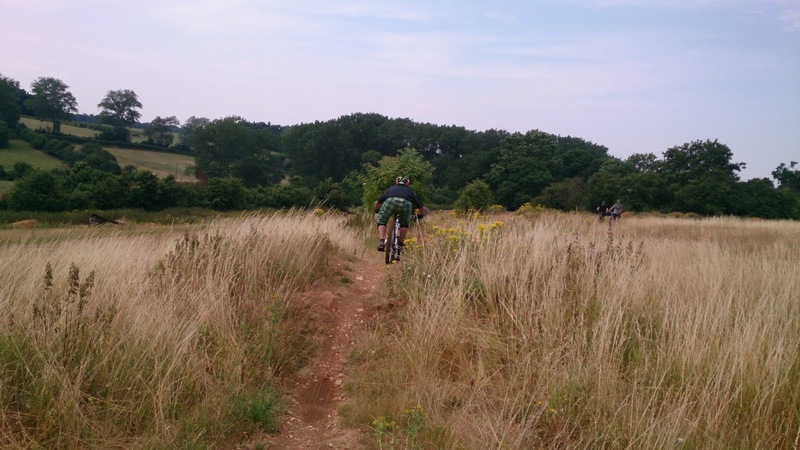 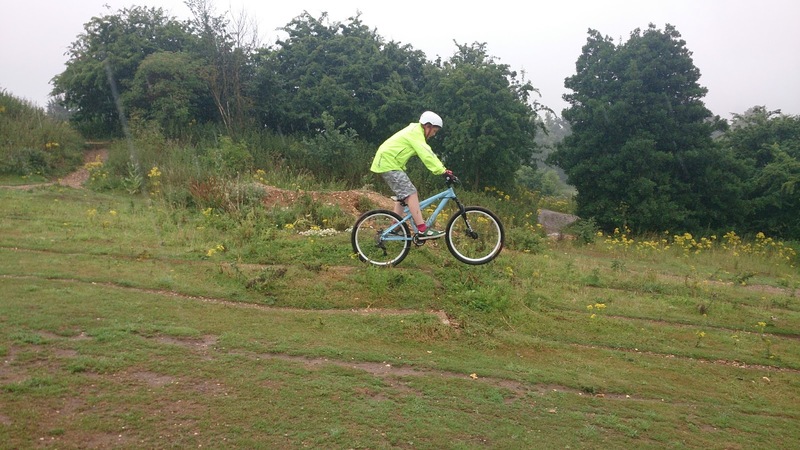 We had a quick break, and when we resumed, we worked on the whole skills trail, and sam was soon linking the 14 sections together, riding quicker and more in control than he has ever felt before. I then showed him the tabletop, where I managed his speed, and found a speed that matched his jump technique, in order to fly across both the tabletop and gap jump, and landing perfectly the other side, and even started to make it look nice in the air. 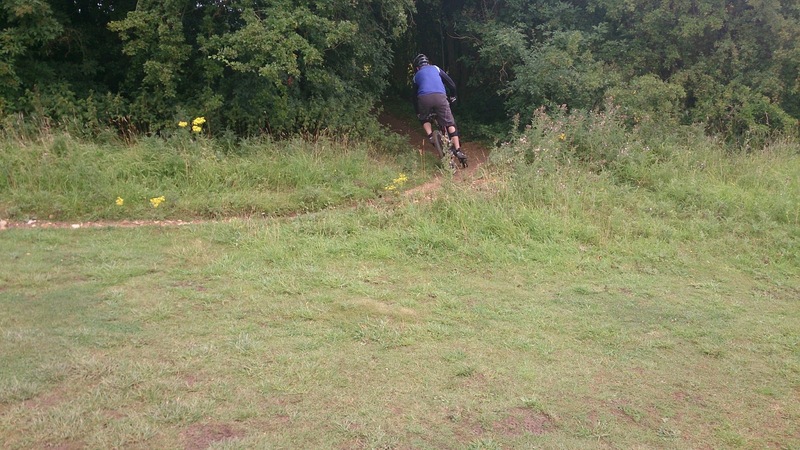 I then moved him onto a pump and jump trail, where he now had to pump to gain his own speed and was beginning to choose whether to pump, jump and manual through the sections. 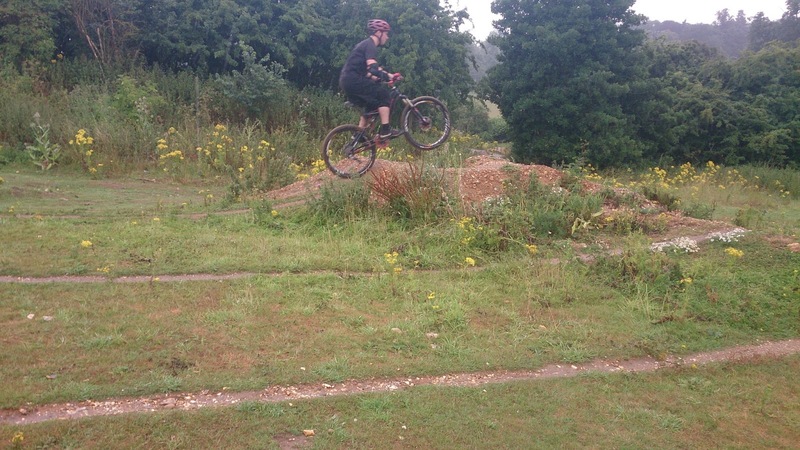 He linked this with the two corners I showed him earlier, and finished off with a wooden gap jump. Mental tiredness brought our session to an end, and I look forward to hearing how the ridings going on. 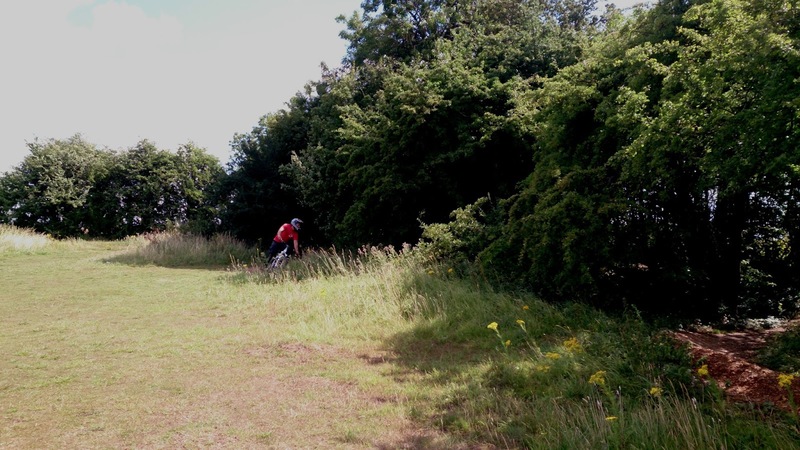 Pete, Anna, Laura, Jim, George, Justin and Chris turned up as arranged and I began working on their footwork, looking and body positioning as I found them missing these skills during my skills check. I worked on their mental and physical skills on the drop technique before we even got onto the skills trail. 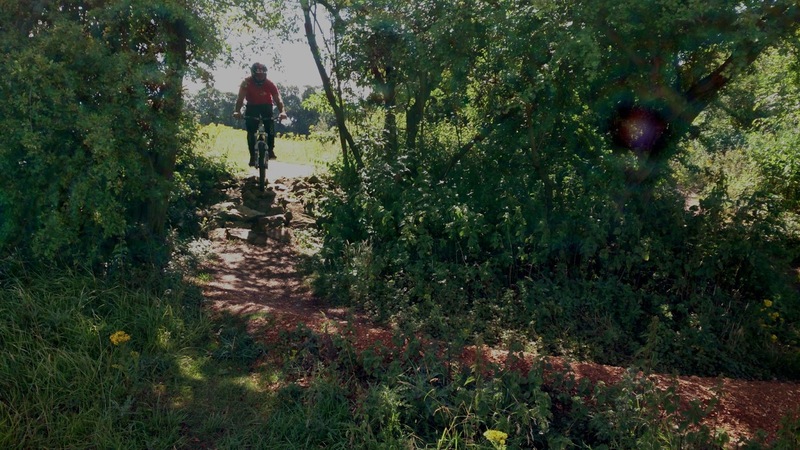 We then began working on linking 14 sections of a trail together using their new skills sets and before long they were riding the trail end to end. 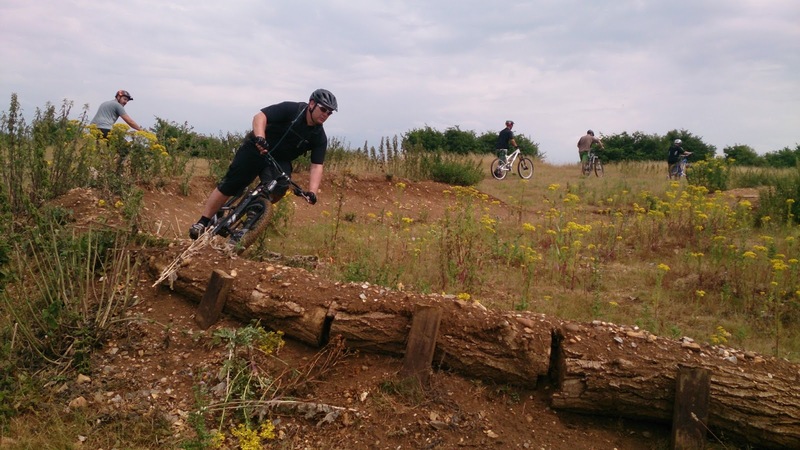 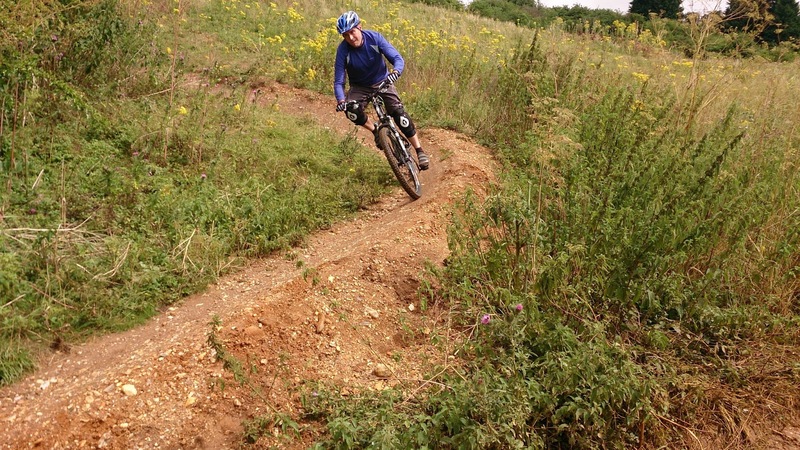 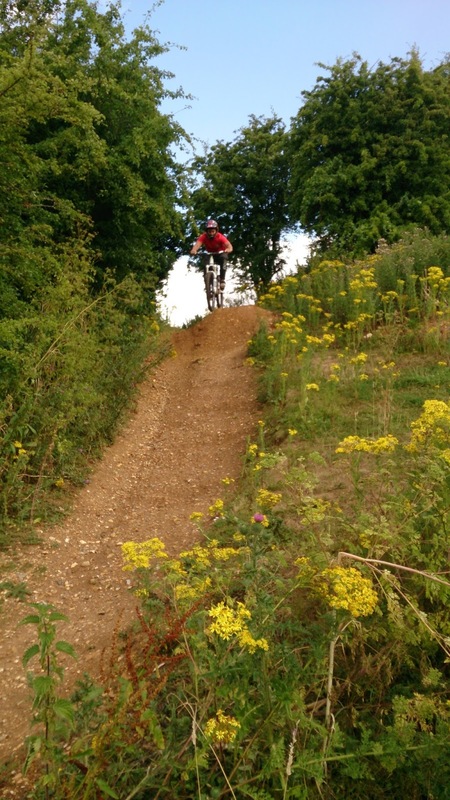 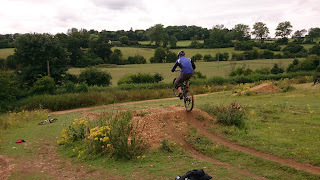 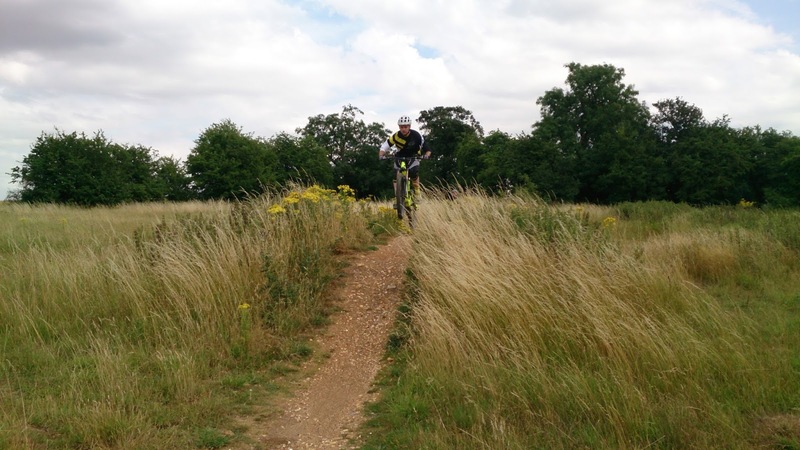 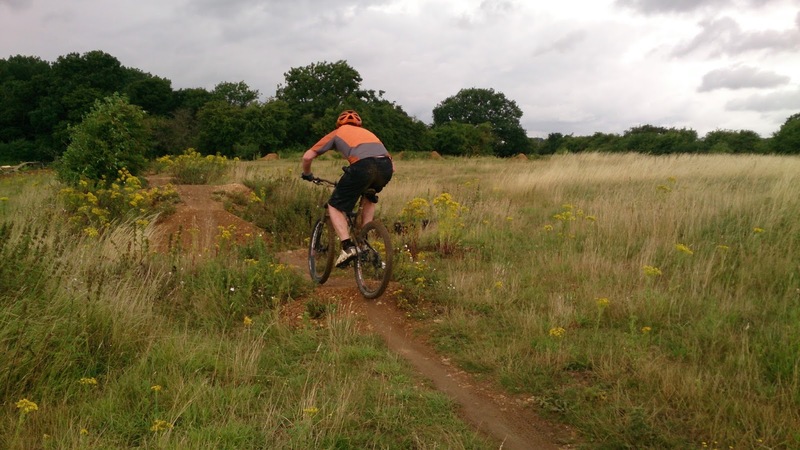 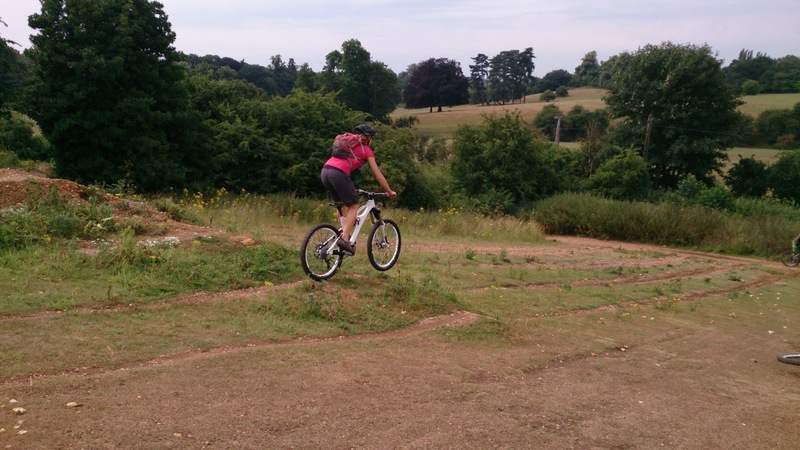 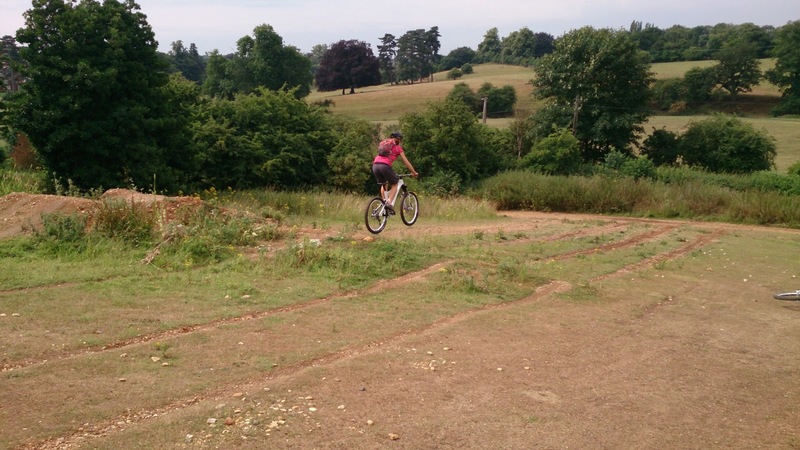 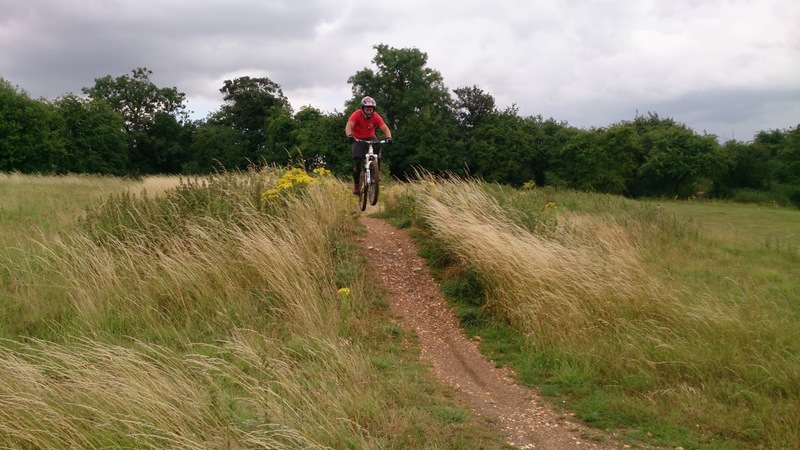 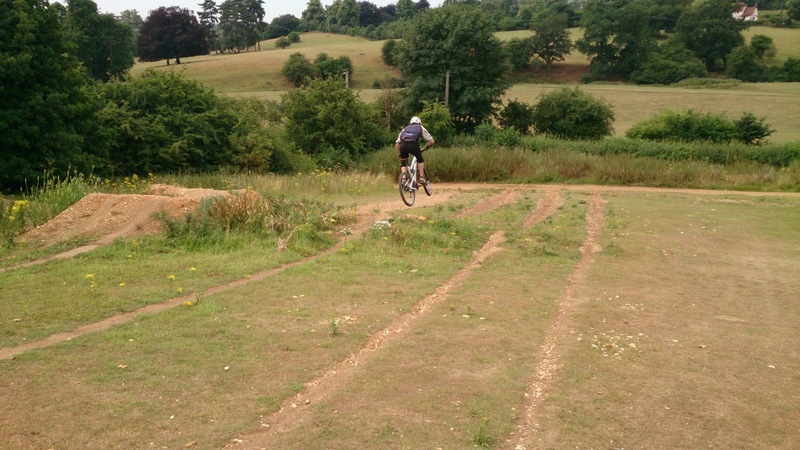 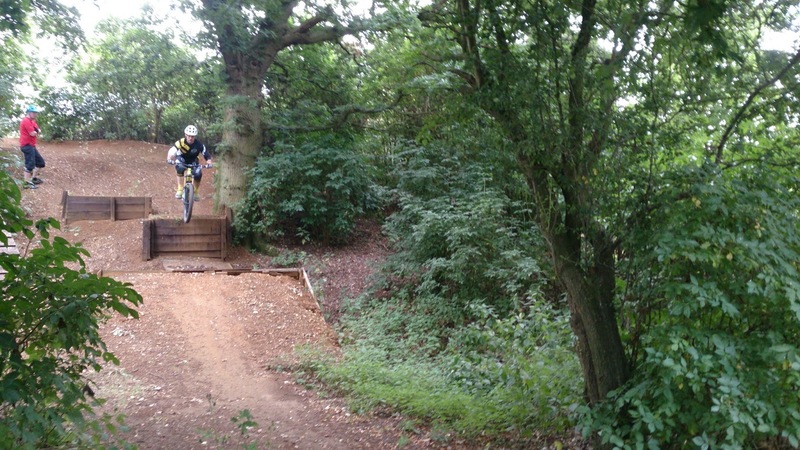 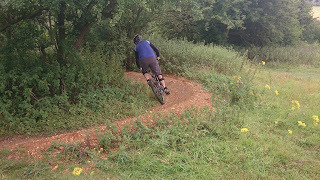 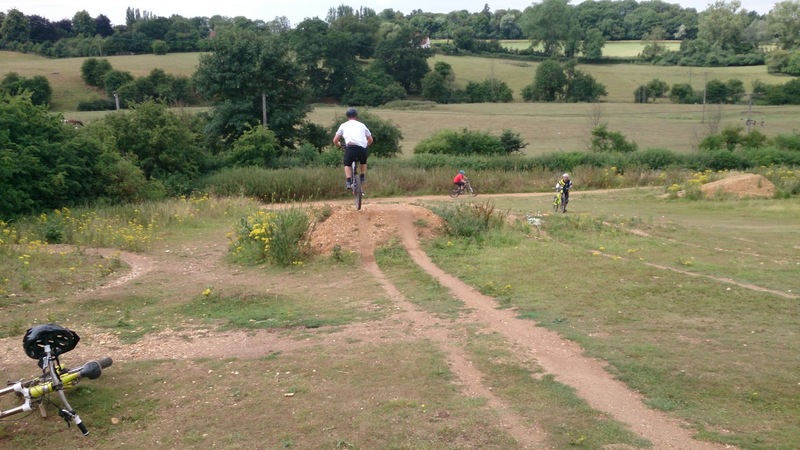 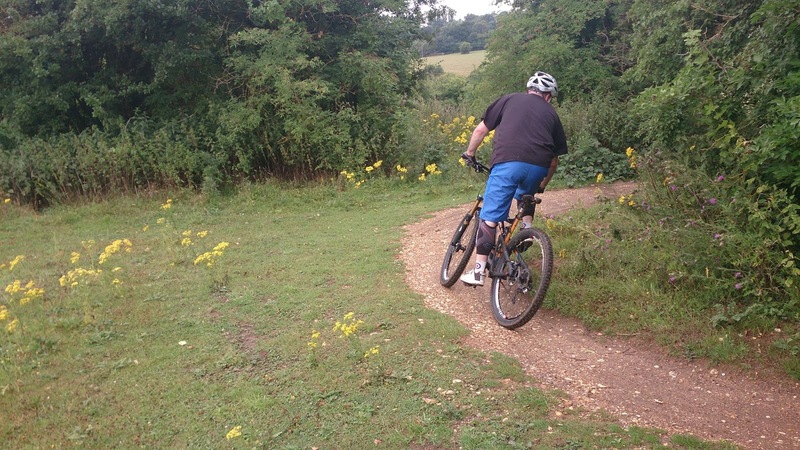 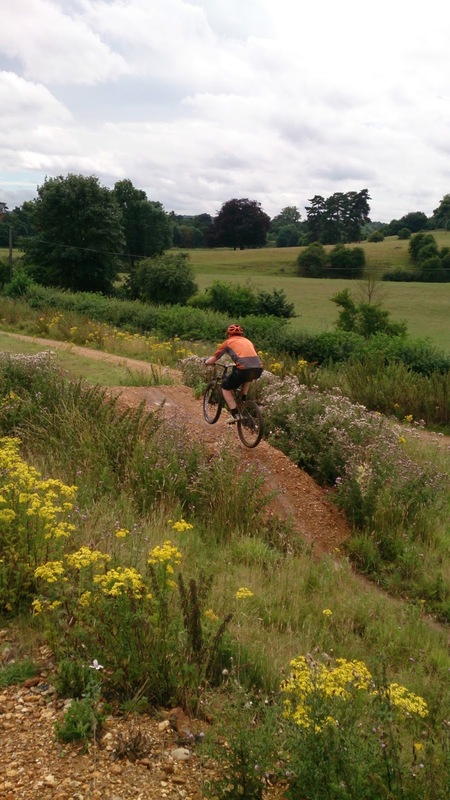 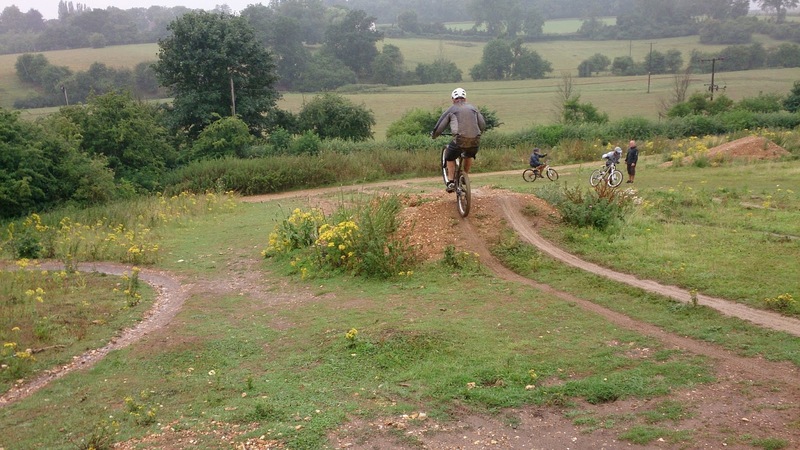 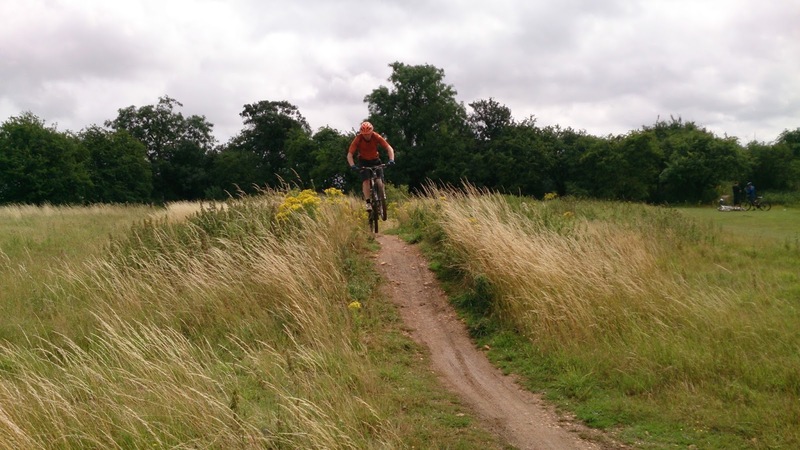 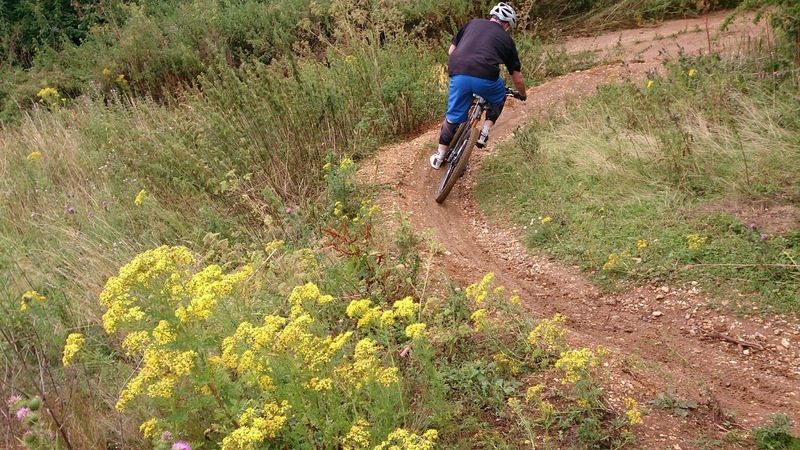 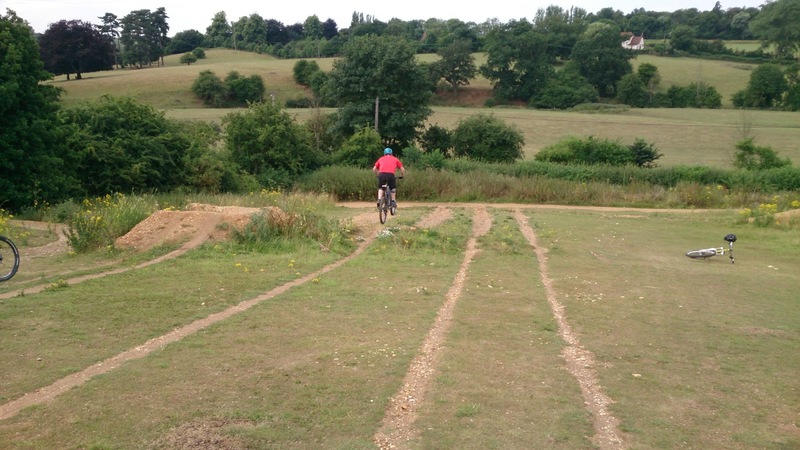 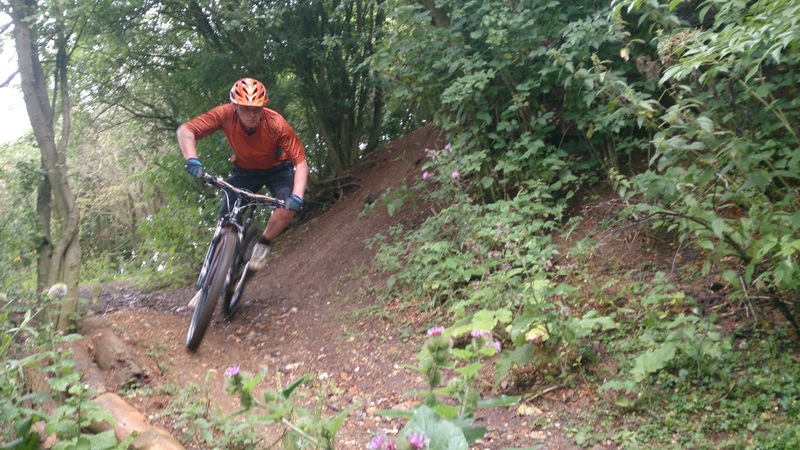 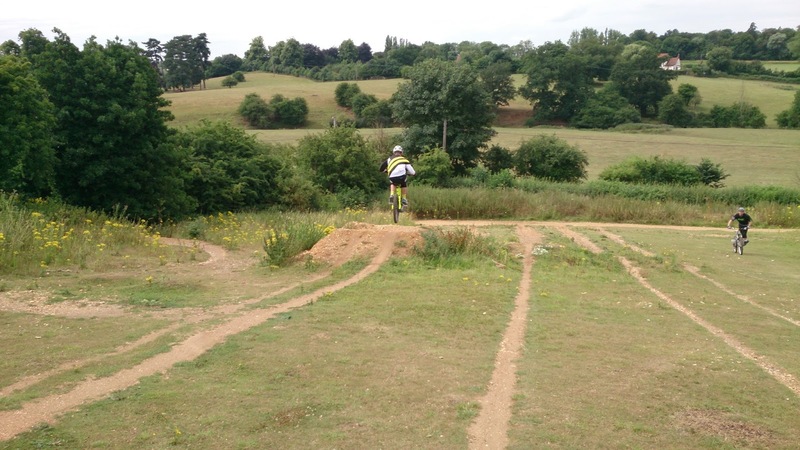 Rock gardens, steps, absorbing, pumping and drop offs were all linked to flat, bermed, off camber and switchback turns. 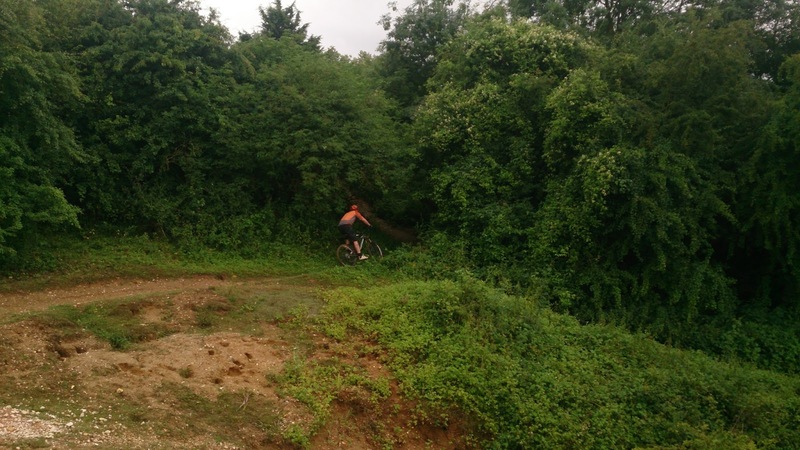 We had a break and resumed with linking 2 berms together and gaining speed from them and also on more advance pumping on the sections of the trail before them. 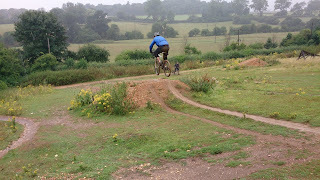 Soon they were riding smoother and faster than before and for some , myself and Nathan demonstrated manuals too as an option on the trail. 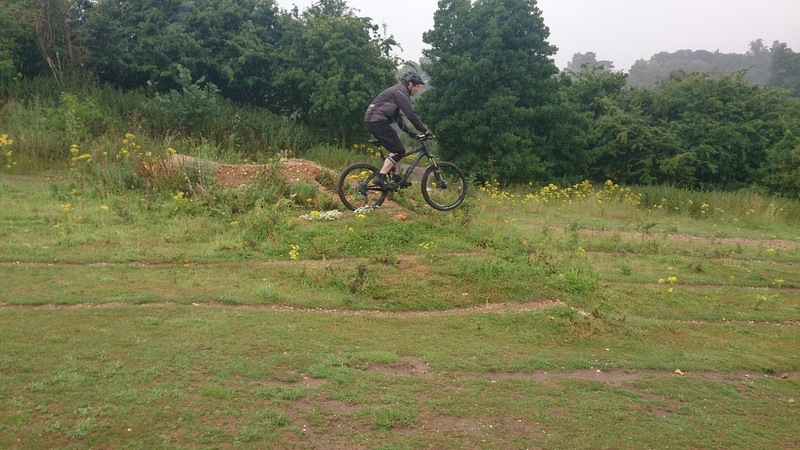 Finally, we worked on riding steeper terrain and dropping into near vertical drop offs and they decided whether to ride each section using their mental skills questions.